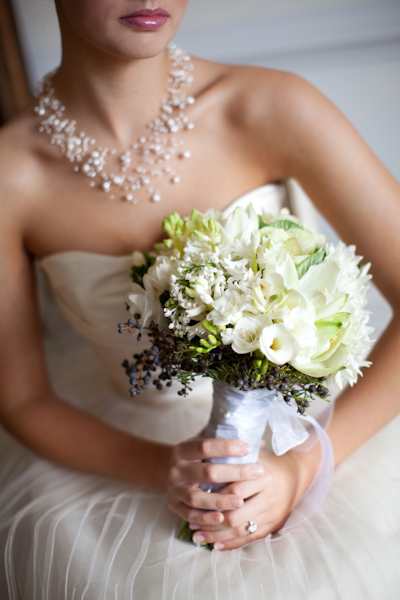 The following gallery features some of our most favorite bouquets. The flowers have been listed for you and we also are happily sharing the season in which the design was created. Enjoy!! 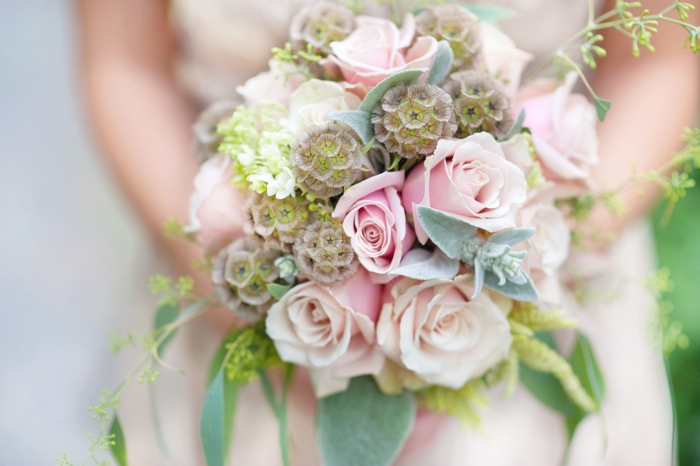 A bouquet of scabiosa pods, candy bianca roses, sahara roses, pee gee hydrangea. This bouquet can be created in the summer, and the fall. 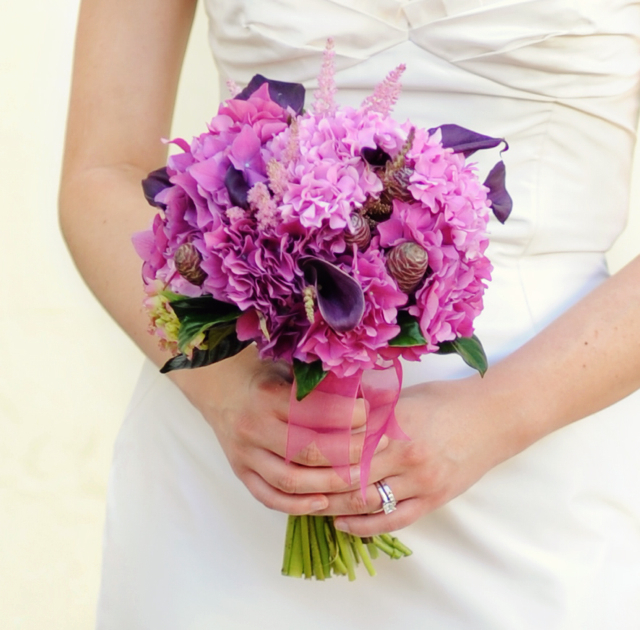 The scabiosa pod is the only item in this bouquet that is difficult to get all year round. Photography by Anne Robert. This bouquet was created with white ohara cabbage roses, red pepper berry, evergreens, antique green hydrangea, and white hyacinthus. Photograph by Anne Robert. 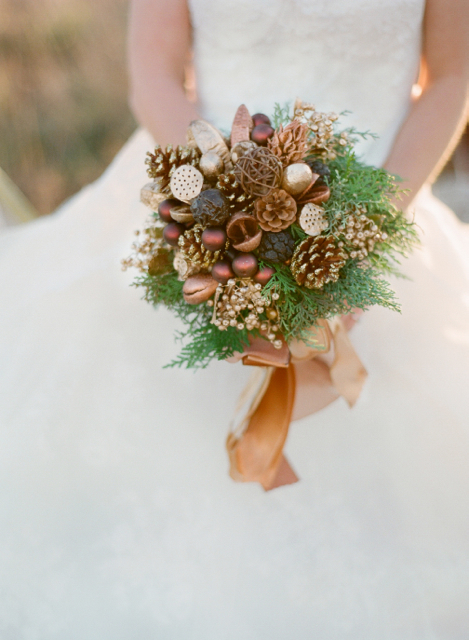 This bouquet was designed with all dried pods, berries, ornaments, and even pine cones. The design featured a collar of evergreens. 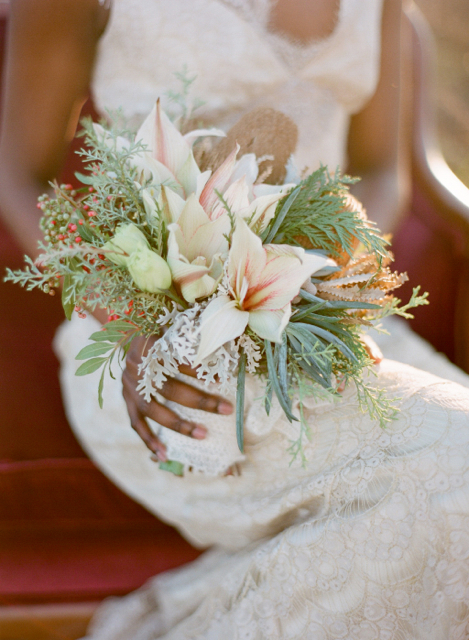 This bouquet is perfect for a winter wedding. Photography by Anne Robert. A beautiful design of white and red amaryllis, pepper berry, banksia, evergreens, and dusty miller. 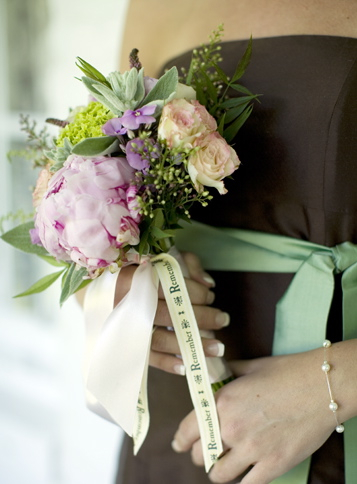 The bouquet was bound with cashmere ribbon. Photograph by Anne Robert. This is one of our most favorite bouquets to be made in the shop. The design has lots of unique elements including flowers from Holly’s garden and a gorgeous ribbon treatment. 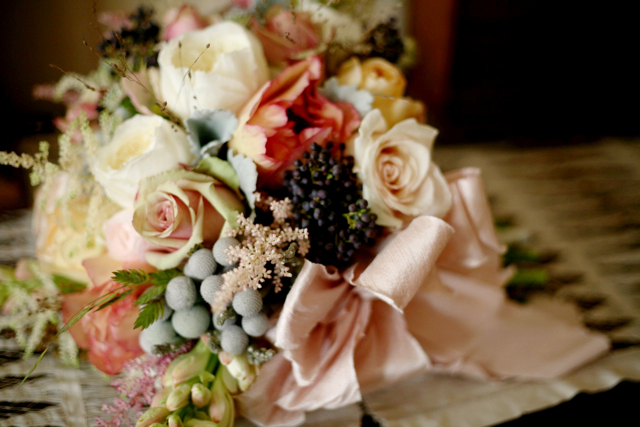 Some of the flowers include peach juliet cabbage roses, various shades of red ranunculus, bleeding hearts, pieris japonica, pink pin cushions, peach tulips, orange roses, red sweet peas, and agonis foliages. The photograph was taken by Cyn Kain. 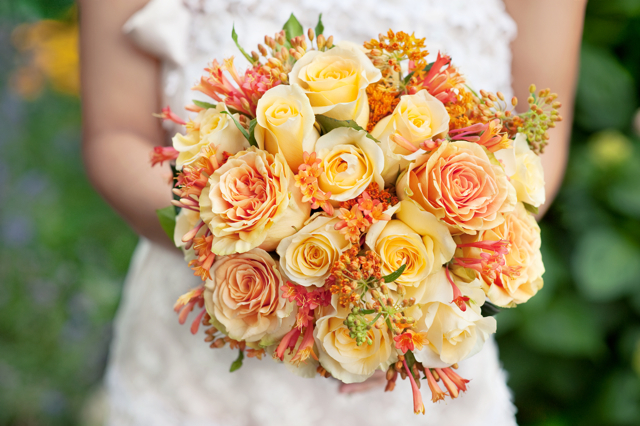 This gorgeous bridesmaid bouquet was created by using the following: peach roses, yellow, orange and red toned ranunculus, red sweet pea, red spray roses, red hypericum berries, red tulips, pieris japonica, coral peony, peach tulips, and red tip photinia. Photograph taken by Cyn Kain. A beautiful red bouquet was created using red calla lilies, red roses, red coxcomb from Holly’s garden, gorgeous local red dahlias, red spray roses, red hypericum berries and green seeded eucalyptus. 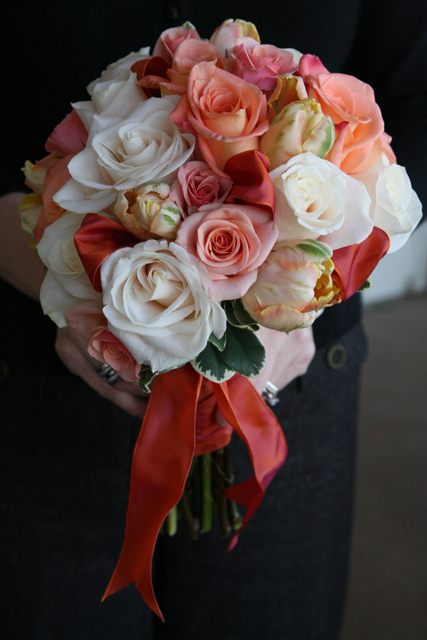 The brides maid bouquet includes similar flowers in orange tones, including orange circus roses. 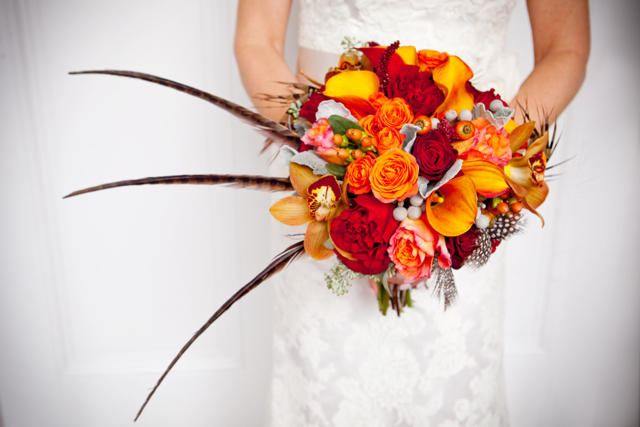 This fun pheasant feather bouquet is an absolute stunner! To create this we used orange calla lilies, brown cymbidium orchids, red wanted cabbage roses, orange free spirit roses, rose hips, orange mambo spray roses, orange hypericum berries, grey dusty miller, grey brunia berries and green seeded eucalyptus. Photograph by Geneveive Leiper. These unique dripping bouquets included a pop of golden apples, white astilbe, white astrantia, green hanging amaranthus, quicksand roses, sahara roses, peppermint roses, porcelina spray roses, burgundy hydrangea, red berries and green seeded eucalyptus. Photograph by Genevieve Leiper. 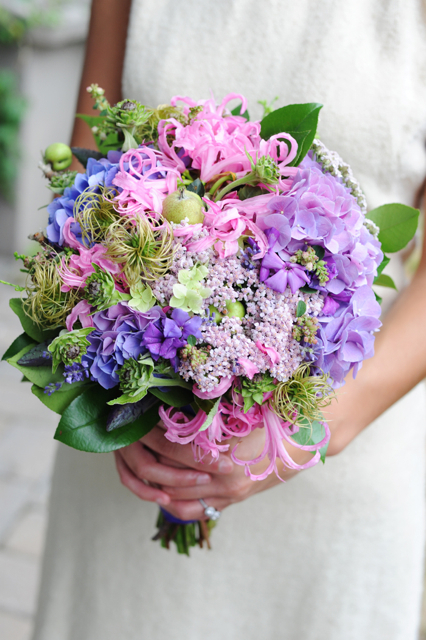 This lush bouquet features a rich ribbon treatment that we love using. 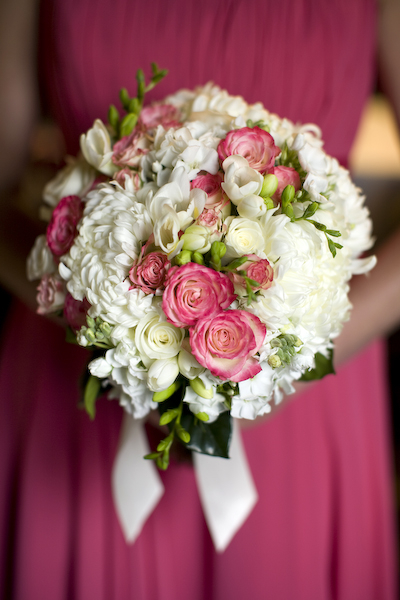 The flowers used to create the bouquet include white cabbage roses, white polo roses, blush pink roses, white ranunculus, white stock, white hydrangea, and green gardenia foliage. 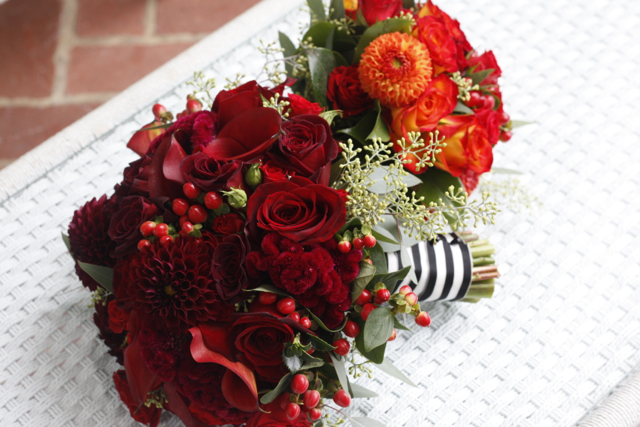 This bright red bouquet was created using red dahlias, orange free spirit roses, red coxcomb, orange gomphrena, red hypericum berries, peach spray roses, peach stock and green seeded eucalyptus. This summer bouquet was created with white zinnia from my garden, scabiosa pods, gooseneck loosestrife, scabiosa pods, white patience cabbage roses, sea star fern, white ranunculus, white dahlias, and seeded euc. The photograph was taken by Kim Seidl. White anemone, silver finesse roses, plum tulips, plum ranunculus, double white tulips, seeded euc, white ranunculus, white majolica spray roses, and blue viburnum berry were used to create this bouquet. The brooch was purchased in NYC. The bouquet can be made in the spring or the fall. The ranunculus and the the anemone are seasonal flowers. Photography by Laura Ashbrook. This very dainty and lovely bouquet was created with clematis vine, lady moon roses, sahara roses, astrantia, silver brunia, seeded euc, white dahlias, and gomphenia. 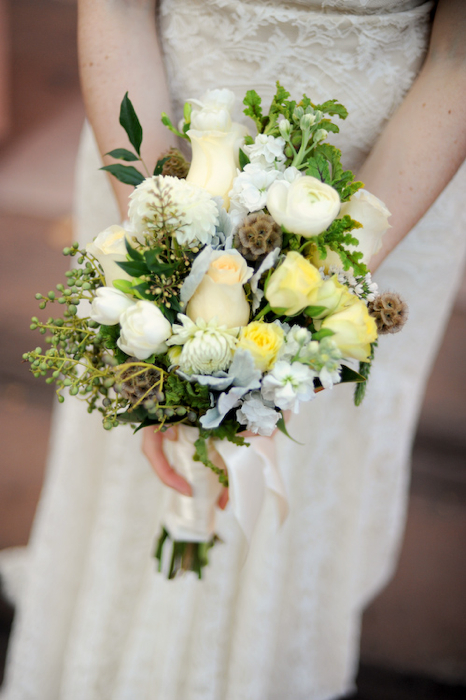 The bouquet was made during the summer and it was the local flowers like gomphenia, clematis vine, and astrantia and that made the bouquet wispy and airy. The bouquet was photographed by Anne Robert. 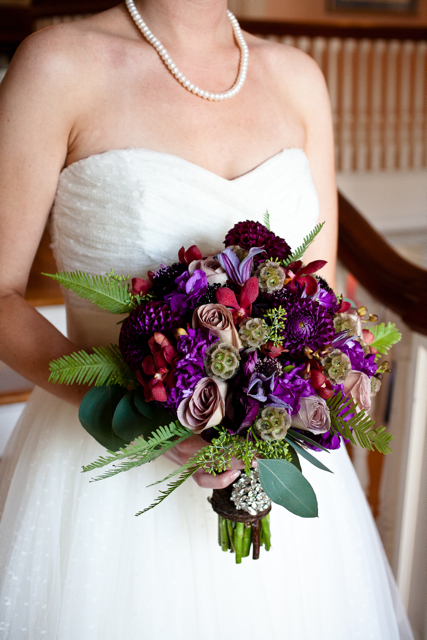 Umbrella fern, scabiosa pods, purple dahlias, red orchids, amnesia roses, purple stock, seeded euc, and purple clematis flowers were used to create this fun fall bouquet. 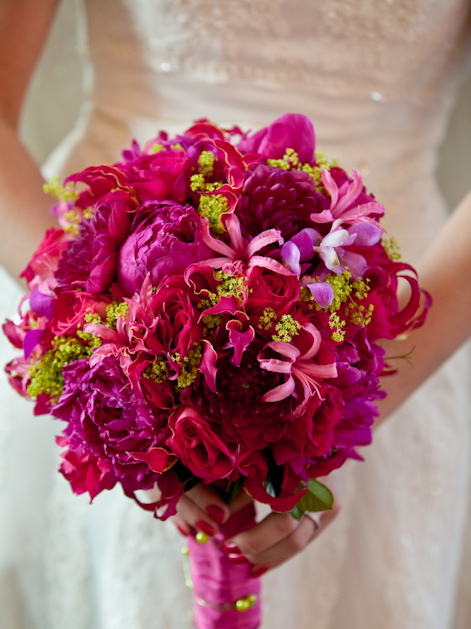 The bouquet could be created in all seasons if the dahlias and scabiosa pods were substituted. Photography by Robert Holly. White dahlias, dark blue hydrangea, white cabbage roses, blue thistle, green hypericum, white ranunculus, white stock, and silver dusty miller were used to make this summer to fall bouquet. Photography by Saskia. 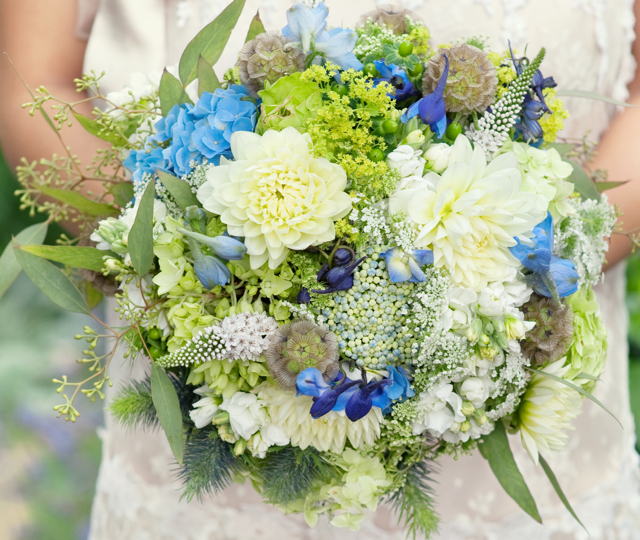 Green cabbage roses, green hydrangea, dark blue delphinium, blue thistle, green dianthus, green hypericum berry, seeded euc, white cabbage roses, and white dahlias were used to create this bouquet. 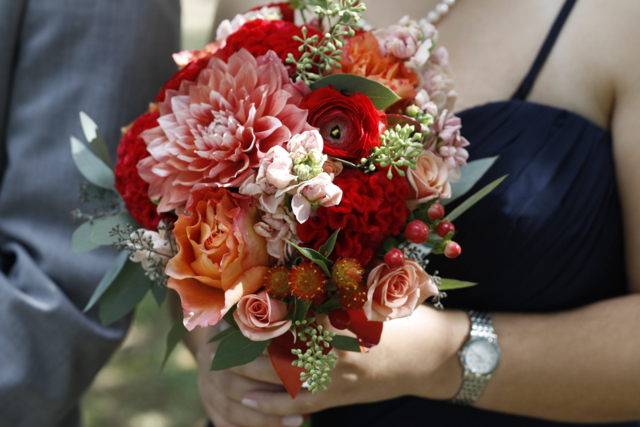 This bouquet was created in the fall but could be created in most seasons if you skipped the dahlias. Photography by Tracy Timmester. 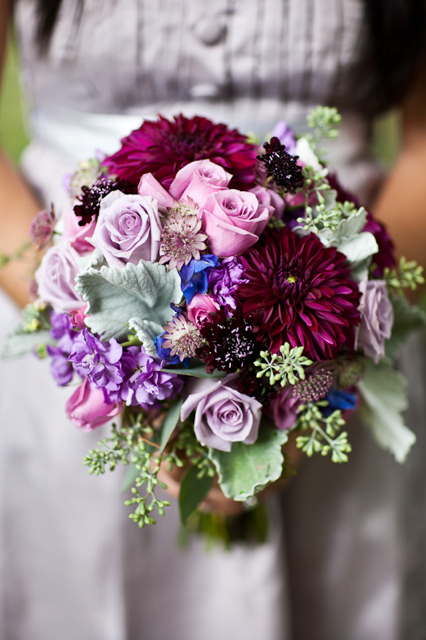 Lavender stock, lavender roses, purple dahlias, lavender spray roses, astrantia, green seeded euc, blue delphinium, dark purple scabiosa flowers, and silver dusty miller were used to create this bouquet. 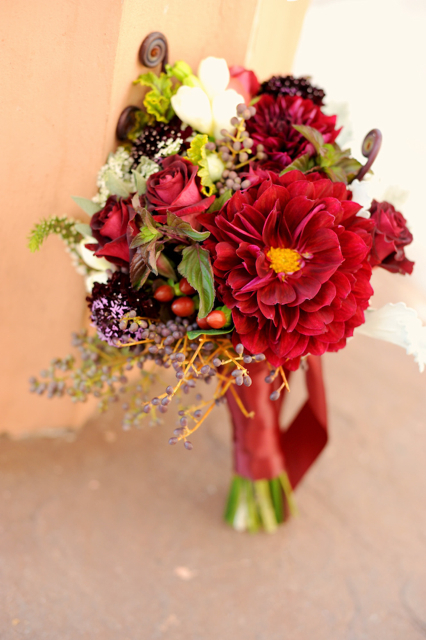 This is a summer to fall bouquet because of the dahlias. Photography by Vicki Grafton. 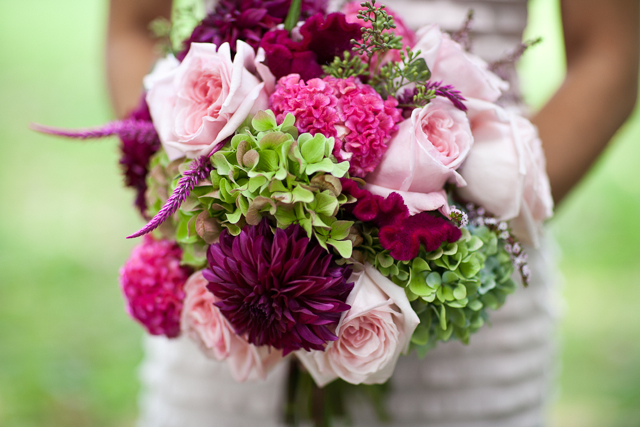 Antique green hydrangea, pink ohara cabbage roses, hot pink coxcomb, hot pink celosia, and green seeded euc were used to create this bouquet. This bouquet can be created in the summer or the fall. Photography by Vicki Grafton. 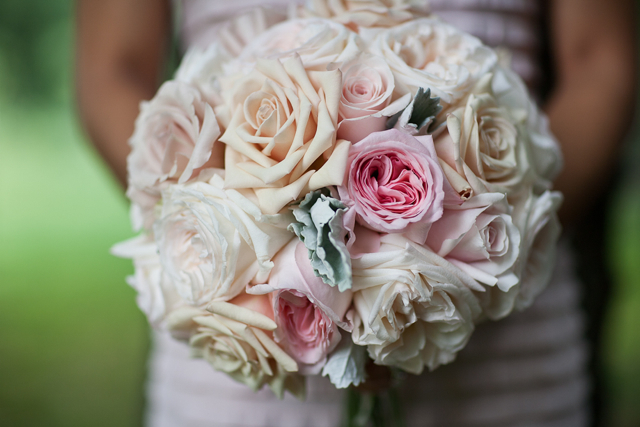 This bouquet is all about the roses, we used white ohara roses, pink ohara roses, pink candy bianca roses, sahara roses, and dusty miller to create this bouquet. Photography by Vicki Grafton. 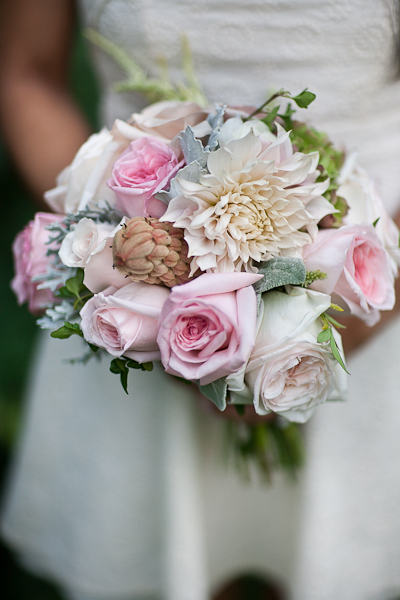 Magnolia pods, cafe au lait dahlias, pink ohara cabbage roses, white ohara roses, clematis vine, silver dusty miller, and sahara roses were used to make this stunning bouquet. It can be created in all seasons except for the fresh magnolia pod but dried ones could be used as a substitute. Photography by Vicki Grafton. Hot pink baroness roses, yves piaget roses, pink mocha roses, hot pink ranunculus, silver brunia, and silver dusty miller were used to create this fabulous vibrant bouquet. 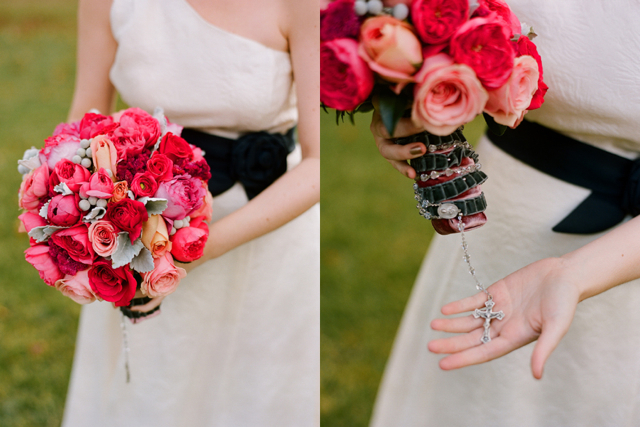 The bouquet was bound with a family rosary. Photography by Kate Headley. White mini callas lilies were gathered together and surrounded by black feathers. The bouquet was bound with black satin ribbon and a fabulous brooch. Photography by Genevieve Leiper. 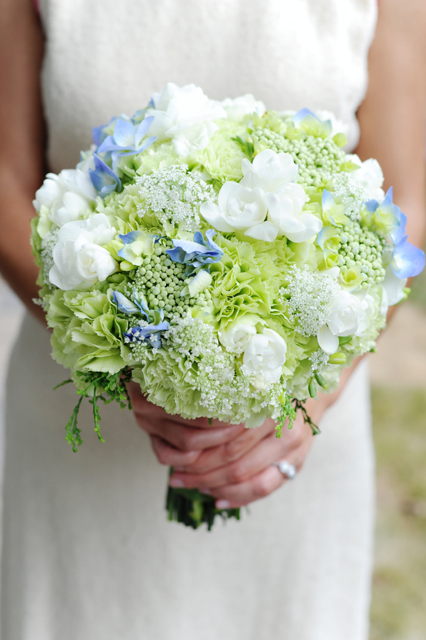 White hydrangea, white veronica, white freeisa, white hellebores, green seeded euc, and blue privet berry were used to create this bouquet. The design can be made in the spring or the fall. The hellebores and the privet berry are seasonal items. Photography by Geneveieve Leiper. 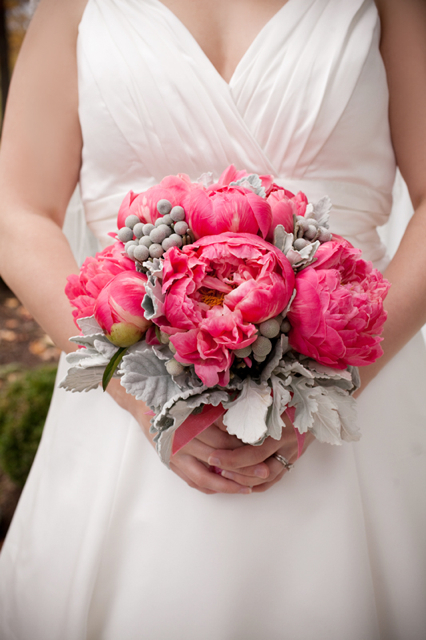 Coral charm peonies, were designed with silver dusty miller and silver brunia. 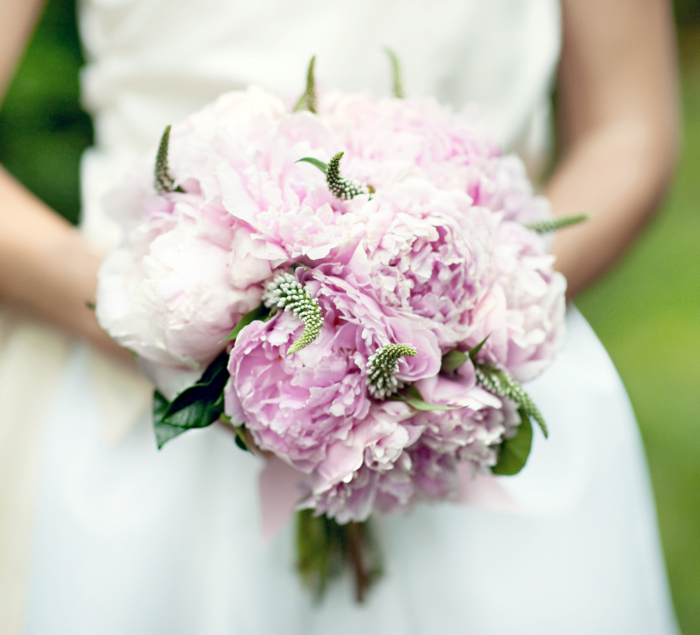 This is a spring time bouquet but on rare occasions peony can be purchased in the late fall and or early winter. Photography by Genevieve Leiper. 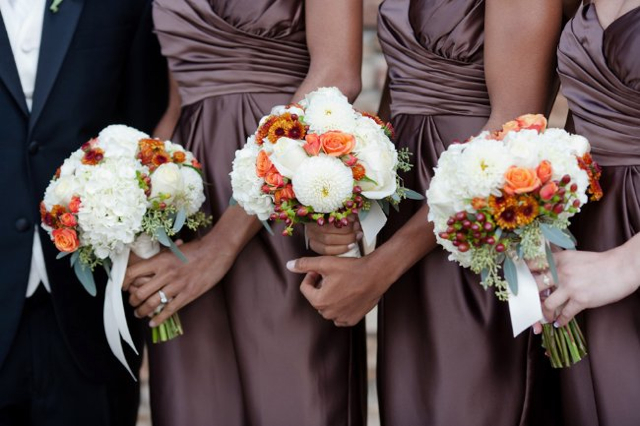 White dahlias, white roses, white hydrangea, orange spray roses, red hypericum berry, bronze button mums, and green seeded euc, were used to create these maids bouquets, and they were paired with the orange bridal bouquet that is the next image. 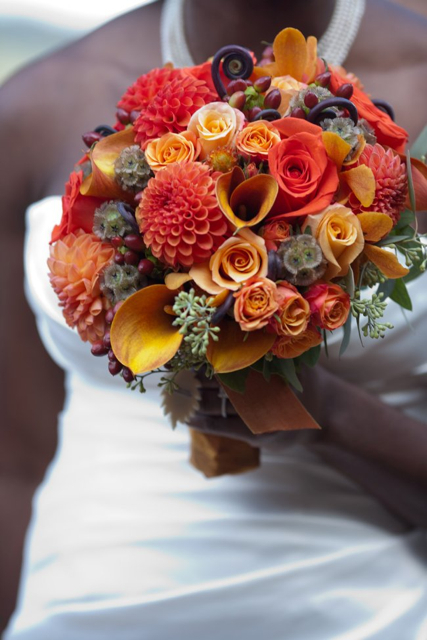 These were fall bouquets but they could be created in all seasons. Inhar Chong of Inhar Photography. 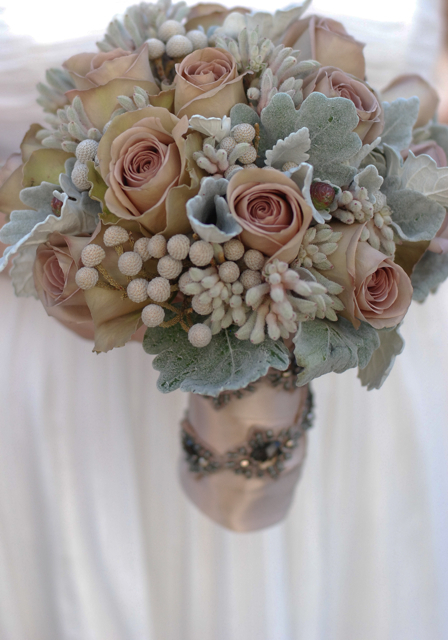 This bouquet was created with tuber roses, silver brunia, caramel antique roses, tree peony, astilibe, wheat, peppermint roses, white cabbage roses, sahara roses, privet berry, dusty miller, fiber optic grass, hellebores, and unique foliages. 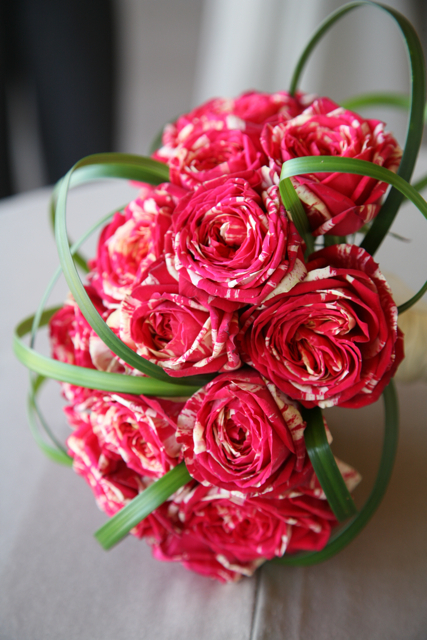 The bouquet was bound with silk dupioni ribbon. 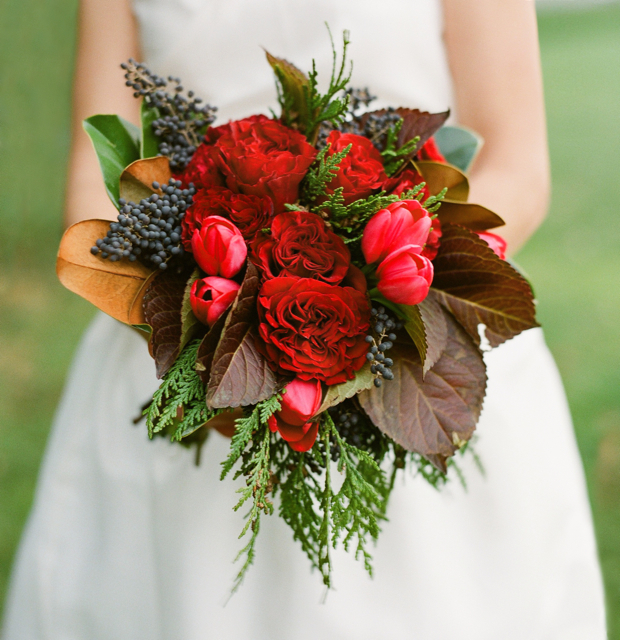 This bouquet was created in the fall but the peony were imported from Chile. Photography by Holly Heider Chapple. A bouquet of hot pink peonies straight from my garden, with a touch of snowball bush viburnum. Available only in the Spring. Photography by Genevieve Leiper. 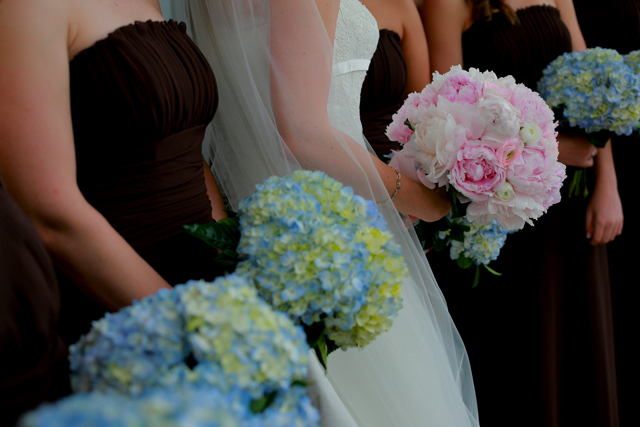 Bouquets of cream hydrangea, ilsa spray roses, cream de la cream roses, and milky way for the maids. The bride carried juliet cabbage roses, white cabbage roses, and pale yellow cabbage roses. Available in all seasons. Photograph by Kate Headley. 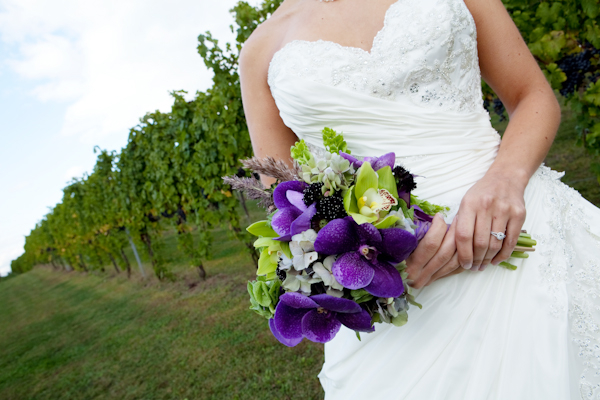 Dark purple vanda orchids, antique green hydrangea, green cymbidium orchids, and ornamental grasses. Available in all seasons. Photograph by Genevieve Leiper. This bouquet was created in the Winter but it features some Spring flowers like tulips. We also used white cabbage roses, silver brunia, dusty miller, white mini callas, white cabbage florets (these are only available in the Fall or Winter) dried wheat and lotus pods. Photography by Anne Robert. This bouquet was created with hot pink peony, orchids, nerine lily, freesia, roses, dahlias, gloriosa lily and green alchemilla it was photographed by The Observatory and it was featured in In Touch Weekly Magazine. This tropical bouquet was created with fishing net, green anthurium, lily grass, birds of paradise, pink mokara orchids, dock, orange pin cushions, gloriosa lily and a swimming pool. This can be created in most seasons. Photography by Genevieve Leiper Photography. 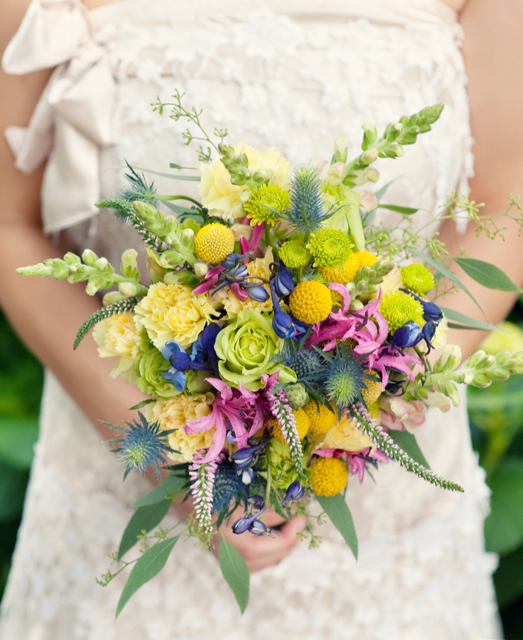 A fabulous loose and airy bouquet created of seeded euc, pink veronica, blue thistle, yellow snapdragons, blue delphinium, yellow billy balls, yellow carnations, green button mums, green cabbage roses, and hot pink nerine lily. This was a Summer bouquet but it can be created in most seasons. Photography by Anne Robert. This is one of my all time favorite bouquets so much of its beauty comes from our garden, it was created with hydrangea from our property, small apples from our tree, nerine lily, herbs from the garden, pink cottage yarrow and the remains of my clematis that was planted by my son. Photography by Kate Headley. Orange milva roses, combined with nigella- love-in-the-mist pods, and copper hanging amaranthus. This can be created easily in the Summer and the Fall. When the pods or amaranthus are unavailable other unique elements can be added for texture. Photography by Anne Robert. 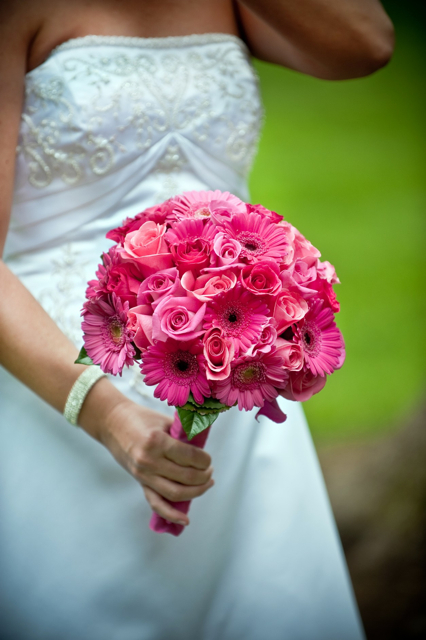 Two shades of pink gerbers and two shades of pink roses were used to create this fun and bright bouquet. Photography by Bob Updegrove. Pink hydrangea from the garden, dark purple callas, pink astillibe, and crown jubilee leucadendron make up this very dreamy bouquet. Tbis is a late Spring or early Summer bouquet because of the astillibe. Photography Anne Robert. 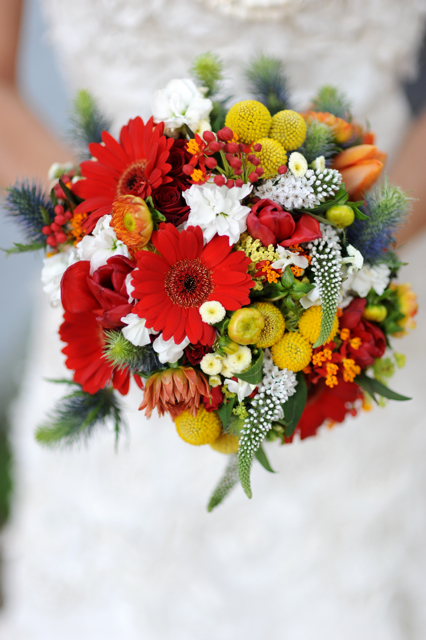 This bouquet was created with blue thistle, red tulips, white stock, white phlox, gooseneck loosestrife, yellow billy balls, tansy, asclepias, red gerbers, and dahlias buds. The bouquet can be created in Spring and early Summer. Photography Anne Robert. This bouquet is truly famous. 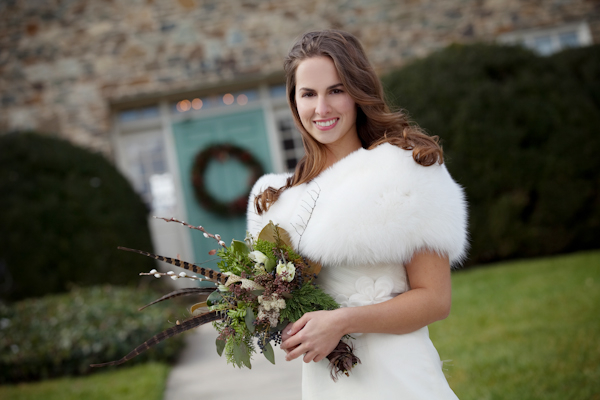 It was featured on several wedding blogs and it also made the cover of Loudoun Magazine. It was one of my most inspired creations. 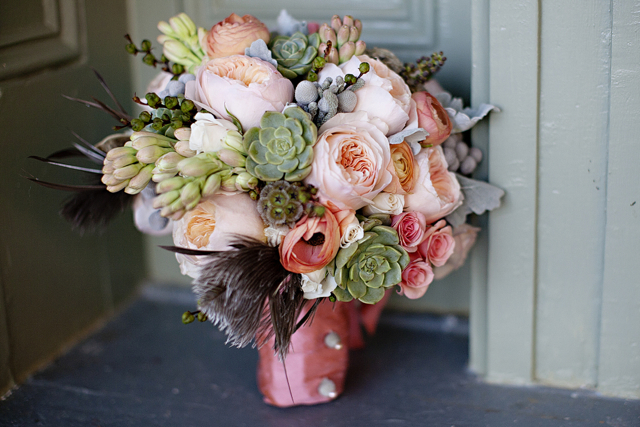 This bouquet featured grey feathers, succulents, peach ranunculus and cabbage roses. 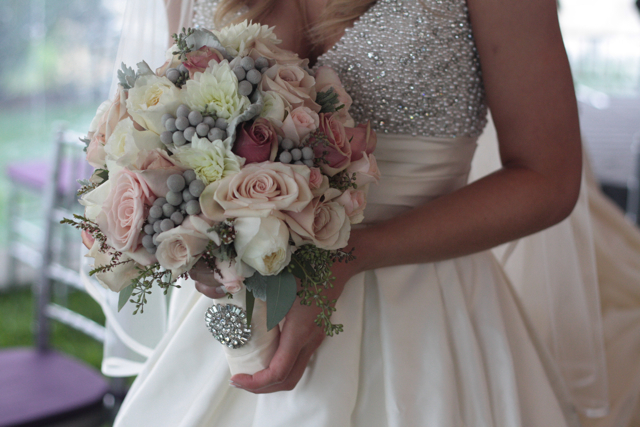 The bouquet also had silver dusty miller and silver brunia. This was a Fall Bouquet. Photography by Kristen Gardner. Bouquets of peach julet roses, orange unique roses, seeded euc, ilsa spray roses, scabiosa pods, crocosmia pods, and berry made up these outstanding designs. Created in the Fall. Photography by Kristen Gardener. 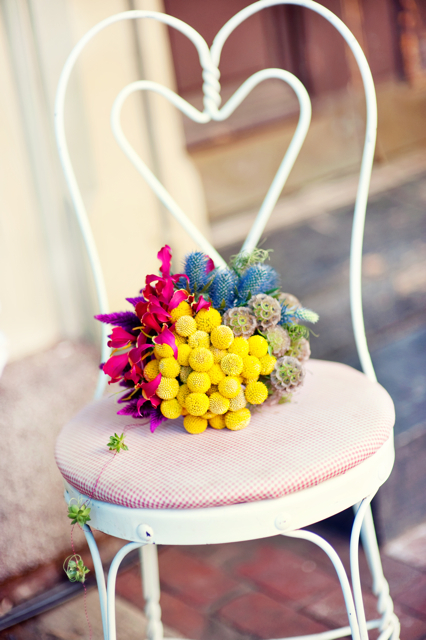 This bouquet was created by clustering together yellow billy balls, blue thistle, scabiosa pods, gloriosa lily, hot pink amaranthus, and a stand of cascading mini succulents. This bouquet can be created throughout the year but the succulents are easiest to obtain in the summer. Photography by Anne Robert. 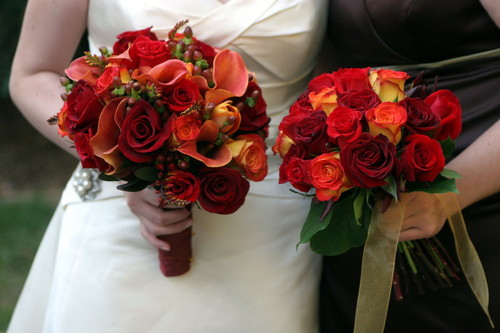 Red roses, circus, roses, mango callas, orange tulips crocosmia, and hypericum berry were used to create these bouquets. 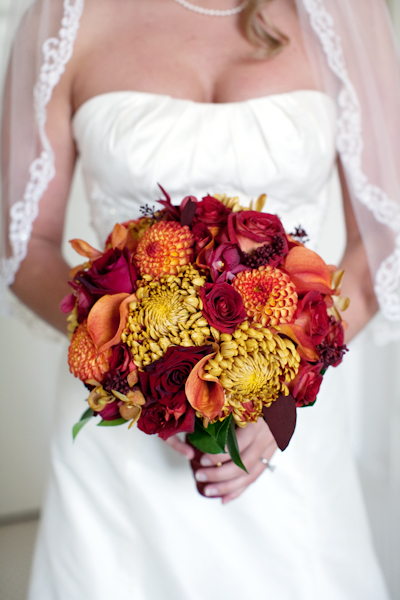 The color choice says Fall but the bouquets can be created in all seasons. This bouquet was created with pink attache roses, electra spray roses, pink phlox, white freesia, pink stock and a collar of gardenia leaves. This bouquet can be created in all seasons. Photography Genevieve Leiper. 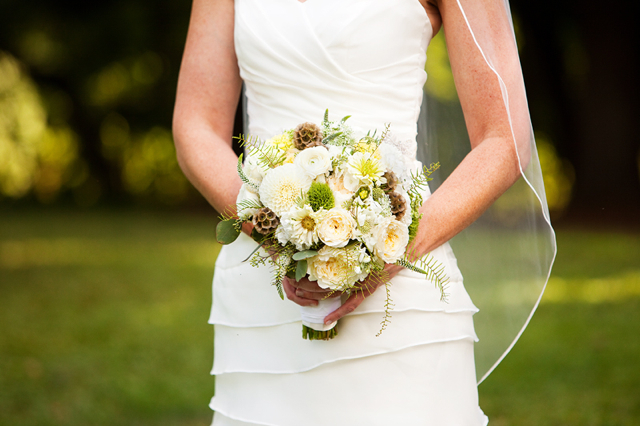 This bouquet was created with seeded euc, creme de la creme roses, white dahlias, white stock, white phlox, scabiosa pods, white ranunculus, dusty miller, scented geranium, privet berry, and yellow spray roses, This bouquet was created in the fall. Photography by Kate Headley. Bronze colored football mums, were used with orange dahlias, orange callas, orange orchids, red and brown roses, and red seeded euc. 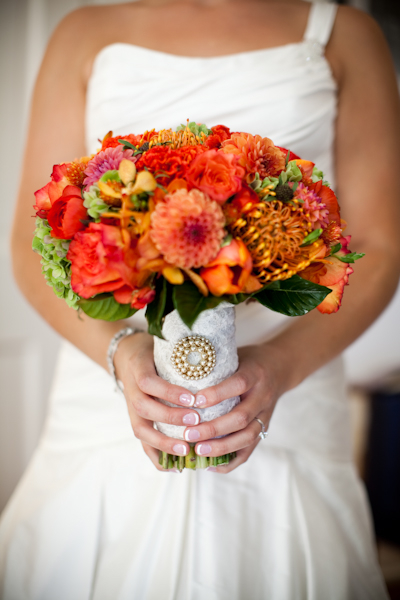 This is a Fall bouquet. Photography Genevieve Leiper. 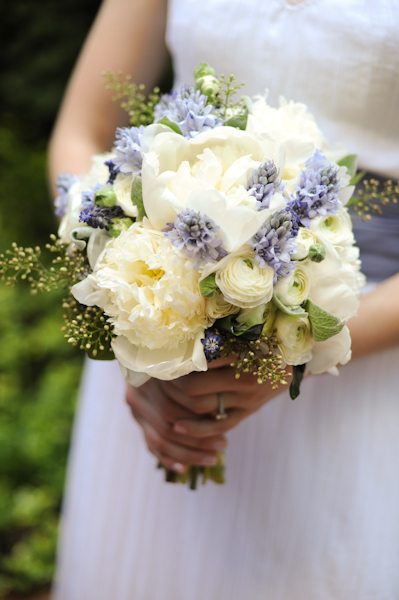 This bouquet was created with white peony, nandina berry, blue scilla, and white ranuculus. This bouquet is available in the Spring. Photography by Kate Headley. Fresh cut, hot pink peonies, straight from my garden. Created in May. Photography by Genevieve Leiper. Dark magenta toned dahlias, with scabiosa flowers and pods, sea star fern, wine colored snapdragons, antique green hydrangea, seeded euc, queen anne’s lace and orchid dahlias from my local grower Don. Created in Fall. Photography by Genevieve Leiper. White football mums, with white stock, white phlox, white freesia and white roses were used to create this maids bouquet. This design can be created all year long. Freesia does get a bit sparse in hot weather but we made this bouquet in July, so it all depends on the heat. Photography Genevieve Leiper. 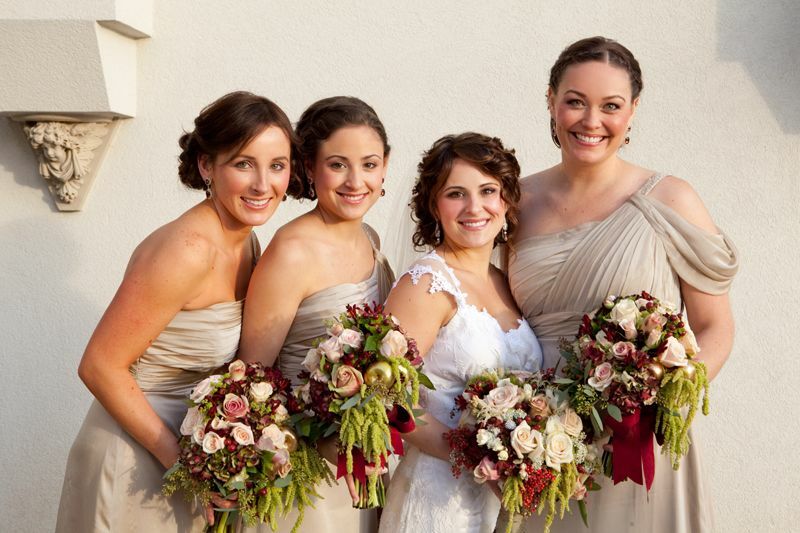 The maid of honor bouquet featured the use of electra spray roses, white football mums, white stock, white phlox, white roses, and white freesia.This was created in the Summer but can be duplicated all year long. Photography by Genevieve Leiper. 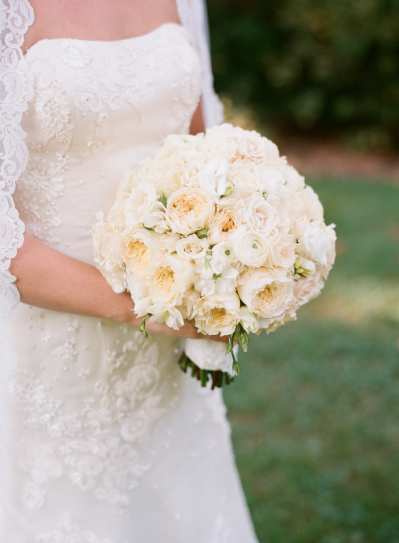 This stunning bouquet was created with a mass of hydrangea on the back side of the bouquet. We embedded red roses, yellow billy balls, orange callas, cedar greens, orange crocosmia, circus roses, red hypericum berry, and green cymbidiums into the hydrangea. 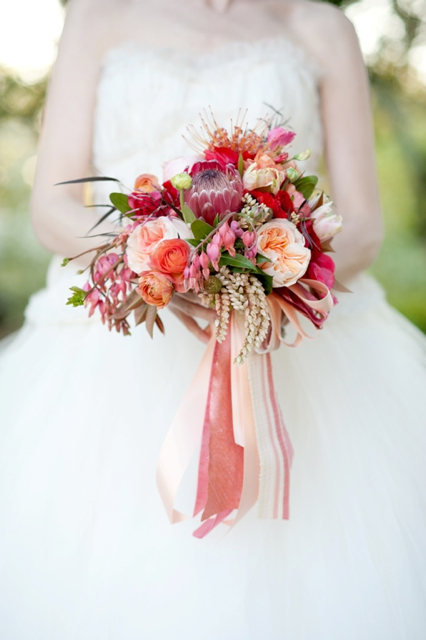 We wove will ow and pheasant feathers into the bouquet. This can be made in all seasons. Photography by Genevieve Leiper. 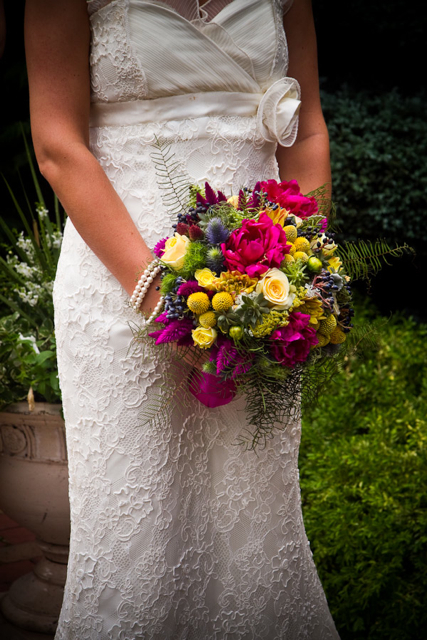 Bridal bouquet of yellow billy balls, hot pink peony, blue thistle, succulents, sea star fern, yellow creme de la creme roses, hot pink amaranthus, and blue viburnum berry created an amazing Spring time bouquet. Photography by Sachs in MD. Maids bouquets of yellow billy balls, blue thistle, hot pink peony, sea star fern, seeded euc, yellow spray roses, green dianthus, and lots of my love…Created in the Spring. Photography by Sachs in MD. Antique burg/green hydrangea, wine colored dahlias, milva roses, seeded euc, scabiosa pods and flowers, wine colored callas, billy balls painted burg, and ornamental grasses bound with bark wire and grandmas brooch. Created in the Fall. Photography by Genevieve Leiper. Pink peony, nandina foliages and berry, pink electra spray roses, pink phlox, and green hydrangea make up this charming maids bouquet. We love the ribbon and the message for the maid. Spring bouquet. Photography Genevieve Leiper. 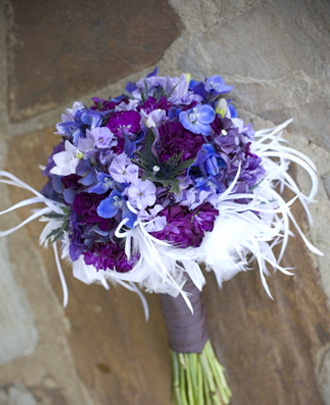 Blue delphinium, blue hydrangea, lavender phlox, lavender, stock and deep purple carnations surrounded by white feathers. This can be created in all seasons. Photography by Genevieve Leiper. 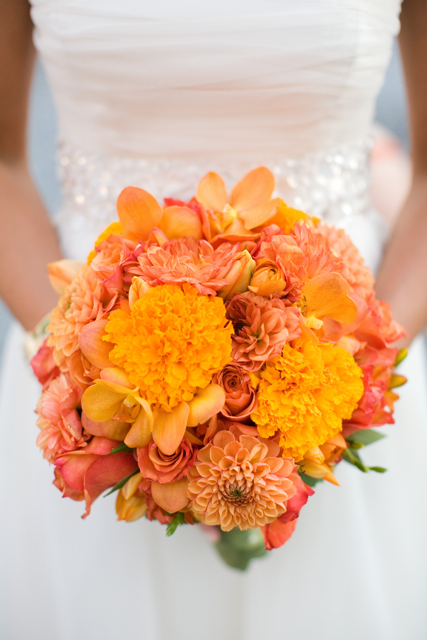 Orange dahlias, orange roses, orange mokara orchids, and orange marigolds were used to create this striking bouquet. This is a Summer bouquet. Photograph by Amy Martin. Pink Peony and white gooseneck loosestrife are the featured flowers in this Spring time bouquet. Peony is typically available from May to June. This is one flower that is most certainly best when used “in season.” The peony can sometimes be obtained in late Fall or Winter but that can not be guaranteed. Photograph by Anne Robert. Bouquet of white peony, james story orchids, green dianthus, blue viburnum berry, sea star fern, nandina foliages, golden roses called combo, and jubilee crown leucadendron. Available in the Spring and Summer. Photograph by Kristen Gardner. 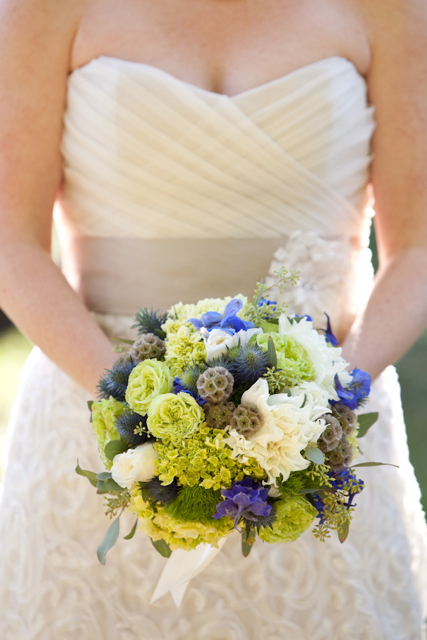 Bouquet designed of white dahlias, blue hydrangea, blue lace cap hydrangea, white gooseneck loosestrife, scabiosa pods, light and dark blue delphinium, queen anne’s lace, blue thistle, seeded euc, white hydrangea from the garden, and alchemilla. Photography Anne Robert. 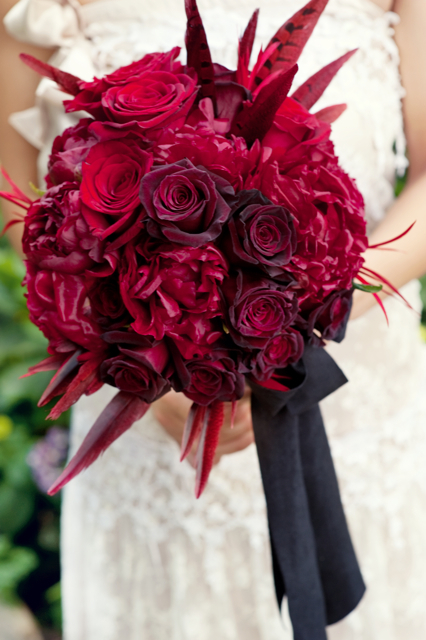 This dramatic bouquet was created with black baccara roses, red roses, burg. peony and red feathers. The bouquet was bound with black velvet ribbon. Photograph by Anne Robert. A luscious bouquet of creme de la creme roses, peach finesse roses, orange asclepsia, and honeysuckle vine from my garden. The roses are available in all seasons, the honeysuckle and asclepsia are summer blooms. Photograph by Anne Robert. 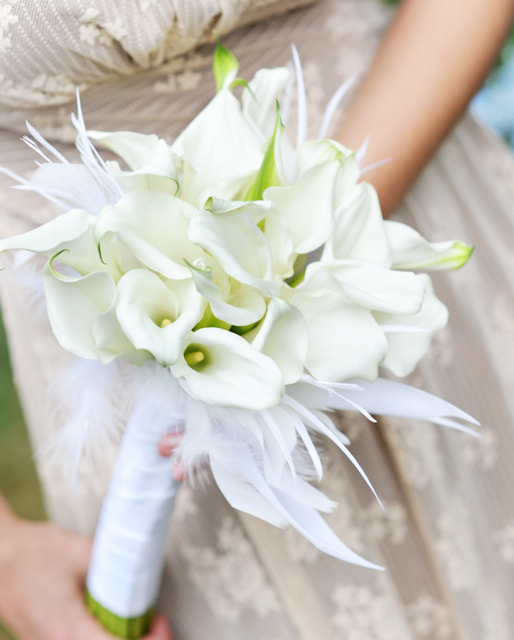 White mini callas, surrounded by white feathers create a stunning bouquet. The design can be made in all seasons. Photography by Anne Robert. 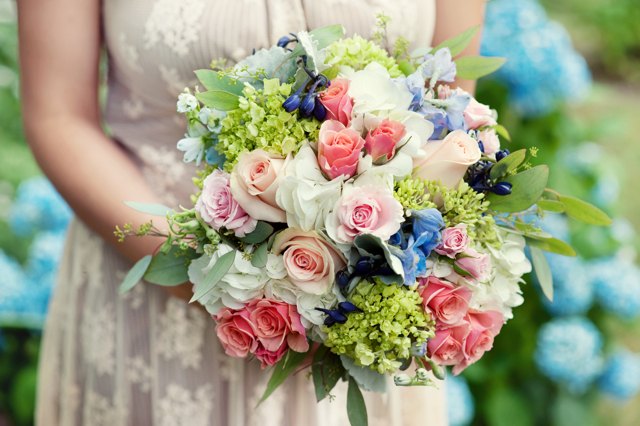 Light and dark blue delphinium, green hydrangea, pink majolica spray roses, ilsa spray roses, cream hydrangea, and cream roses with seeded euc. This bouquet can be created throughout the year. Photography Anne Robert. 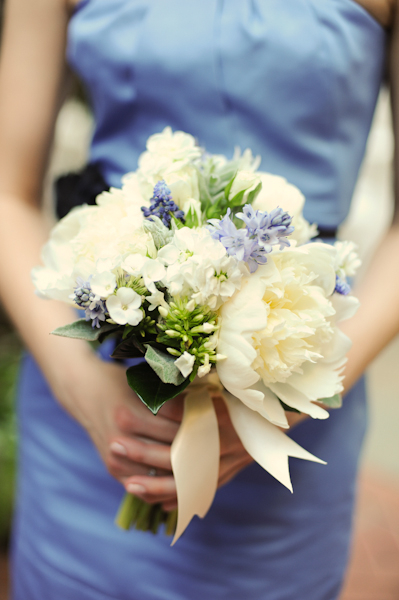 This maids bouquet was created with white peony, blue scilla, blue muscari, and white phlox. This is a Spring bouquet. Photography by Kate Headley. 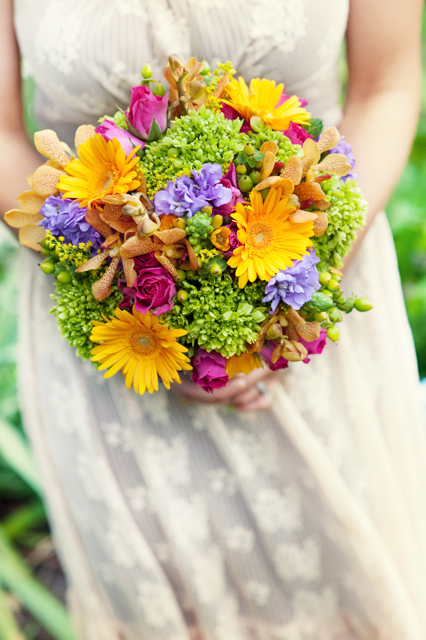 Green hydrangea, yellow gerbers, hot pink spray roses, green hypericum berry, orange mokara orchids, and lavender stock were used to create this bright and happy bouquet. You can have this bouquet throughout the year. 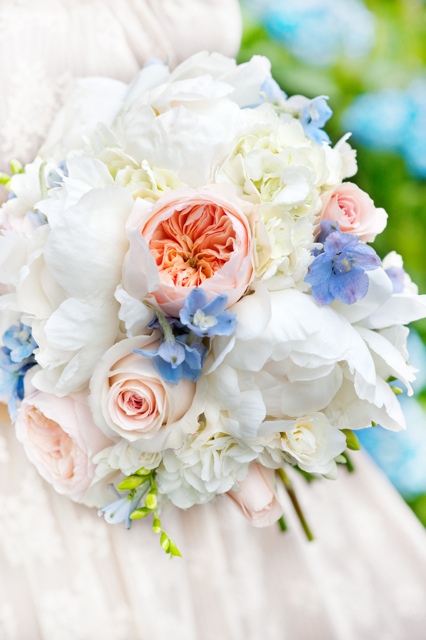 White peony, peach juliet roses, white freesia, cream roses, and light blue delphinium make up this romantic bouquet. Available from Spring to early Summer. Photograph by Anne Robert. 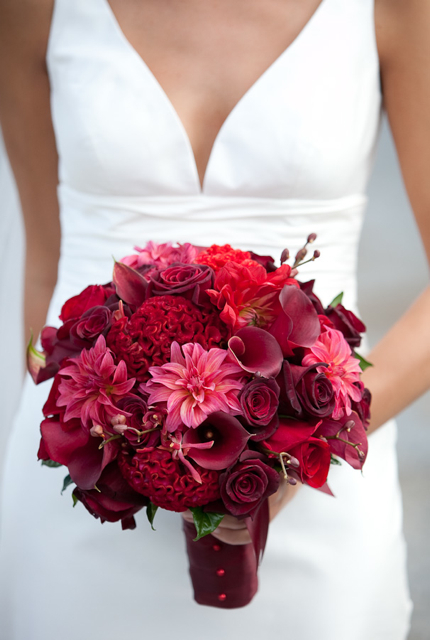 Red dahlias, red mini callas, red coxcomb, red mokara orchids, black baccara roses, and red coxcomb. This bouquet is available in Summer and Fall. Photograph by Tracy Timmester. A bouquet of grey dusty miller leaves, grey kangaroo paws, silver brunia berry, and amnesia roses. The bouquet can be created throughout the year, but the silver brunia will come in and out of season. Photography by Vicki Grafton. 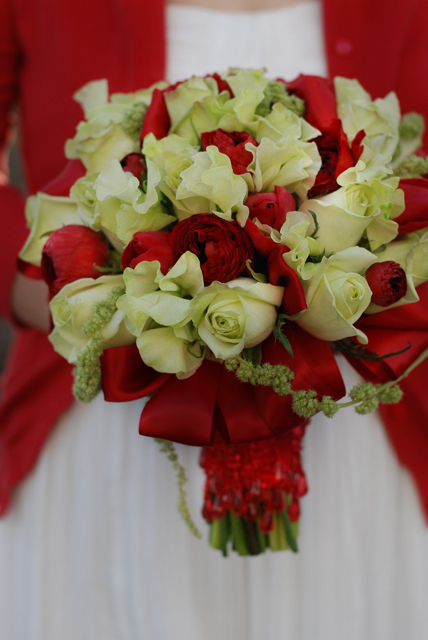 Green tea roses, green sweet peas, and green amaranthus were paired with red tulips and red ranunculus. This is a Spring time bouquet because of the sweet peas and the tulips and ranunculus. Photographed by Vicki Grafton. 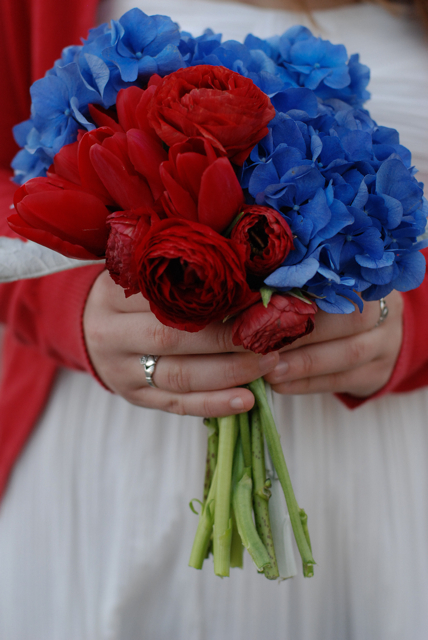 Dark blue hydrangea was paired with red ranunculus and red tulips for a patriotic twist. This bouquet is available in the Spring. Photograph by Vicki Grafton. Juliet cabbage roses, white cabbage roses, milky way roses, cream hydrangea, yellow stock, yellow spray roses, and white stock. 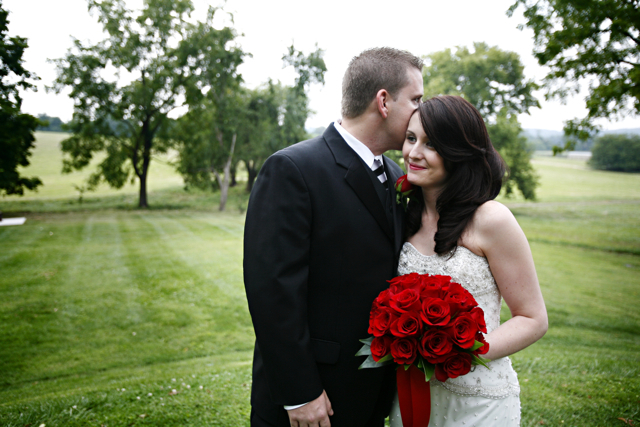 The bouquet was bound with satin ribbon and decorative pins. Available in all seasons. Photography by Kate Headley. Red roses created in a clean round style. 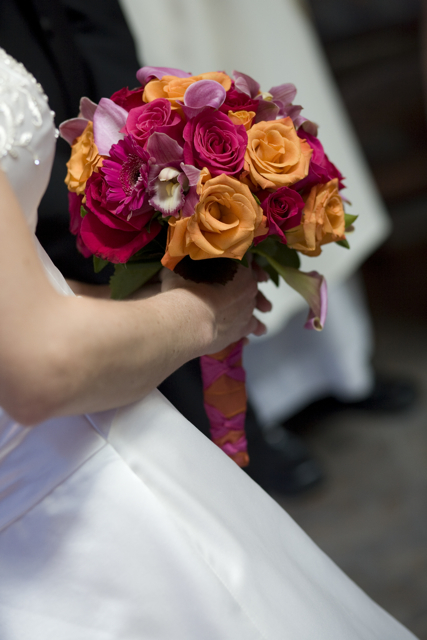 The bouquet is available in all seasons and in many different colors. Photograph taken by Love Live Images. 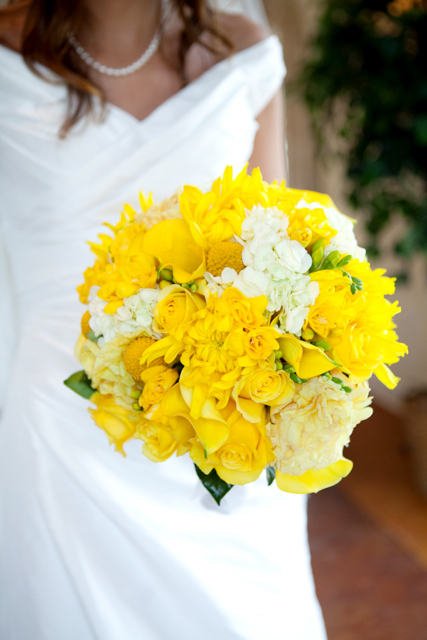 This bouquet is all about the color yellow, we used mini calla lily, yellow tree peony, yellow football mums, yellow billy balls, yellow freesia, and yellow roses. This bouquet was created in the early Spring but if it could be recreated throughout the year if you did not use the peony. Photograph Genevieve Leiper. 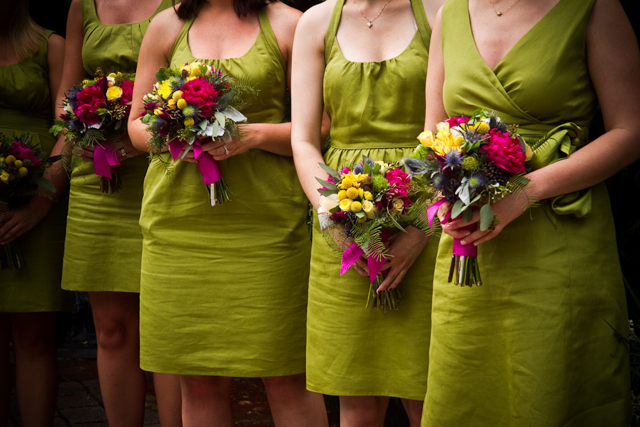 Bright green maids bouquets were created with green spider mums, green cabbage roses, green button mums, green hydrangea, and green carnations. 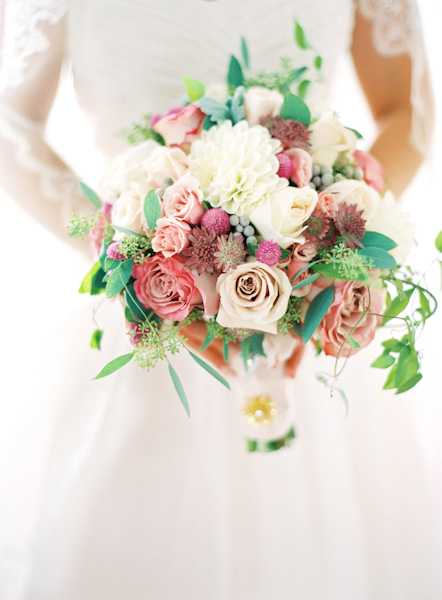 This bouquet can be created in all seasons. Photography by Amy Martin. 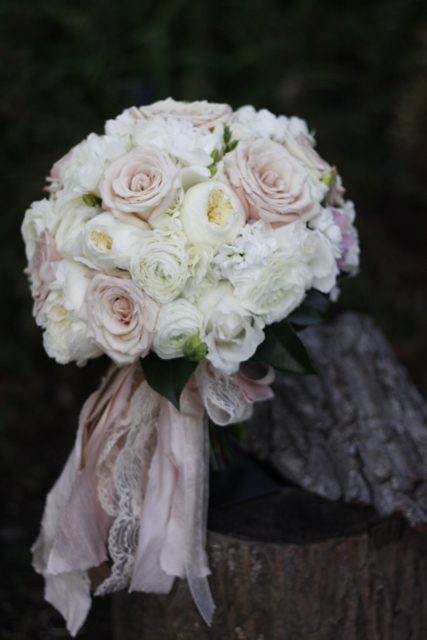 White cabbage roses, white ranunculus, white lizianthus, and white majolica made up this totally romantic bouquet. 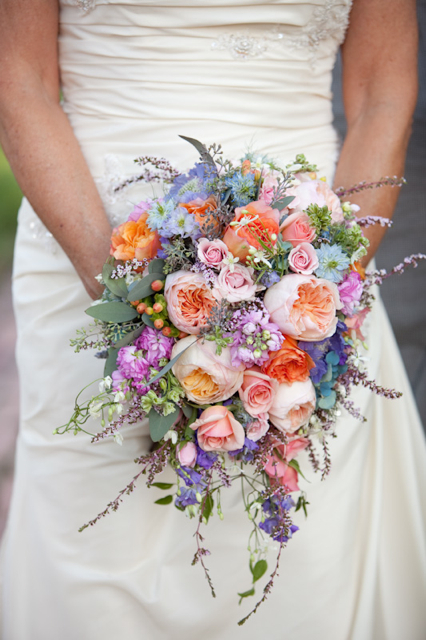 The bouquet was created in the Summer and brides should be able to have this all year long but the ranunculus is always tricky in the warmer weather. Photography by Kate Headley. 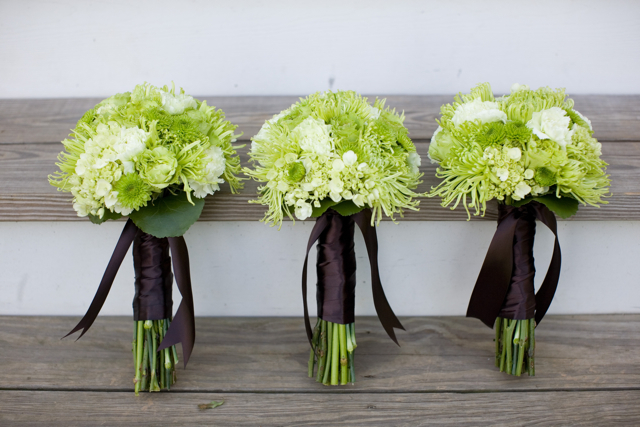 Green cabbage roses, green spider mums, green hydrangea, and green carnations made up this totally green bouquet. This can be created in all season. Photography by Stephanie Ascari. 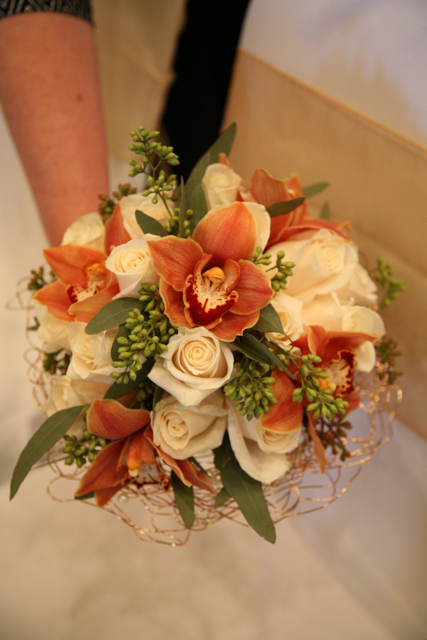 Orange toned blossoms of freesia, roses, tulips, coxcomb, spray roses, ranunculus, and dahlias were highlighted by green cymbidium orchids. The bouquet was made in the Summer the tulips and ranunculus were out of season but obtainable. Photography by Stephanie Ascari. 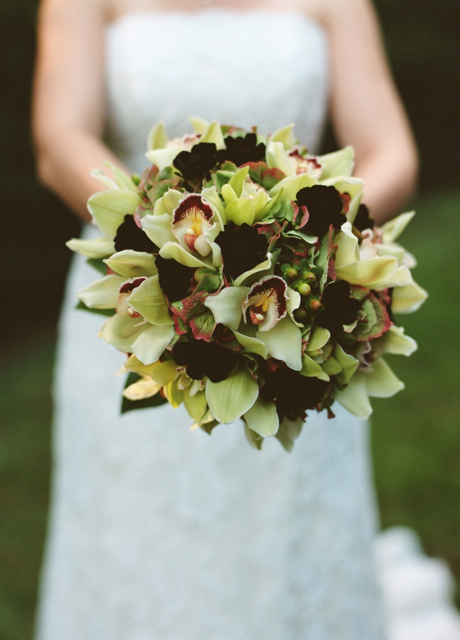 Green cymbidium orchids were used with chocolate cosmos blooms. 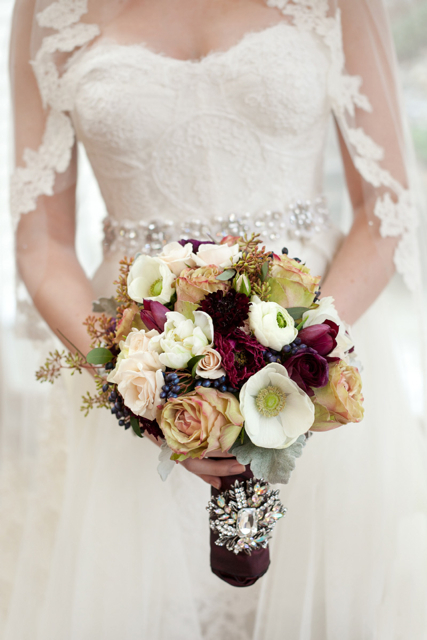 The bouquet began with a handful of antique green hydrangea, and green hypericum berries were used as well. This is a Summer bouquet and the chocolate cosmos are always hard to obtain, but worth the effort. 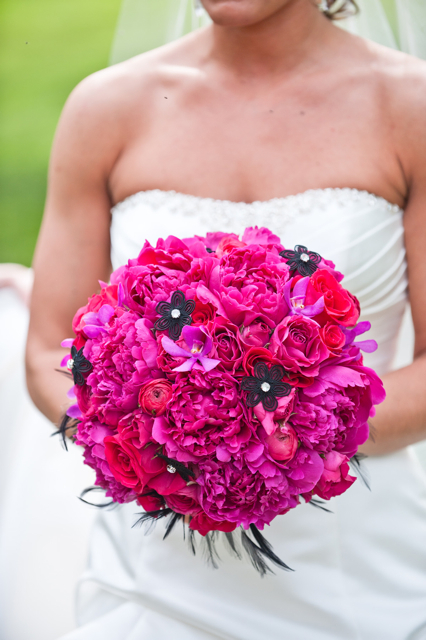 Hot pink peony, hot pink roses, hot pink spray roses, hot pink mokara orchids, and hot pink ranunculus were used to create this very hot bouquet. 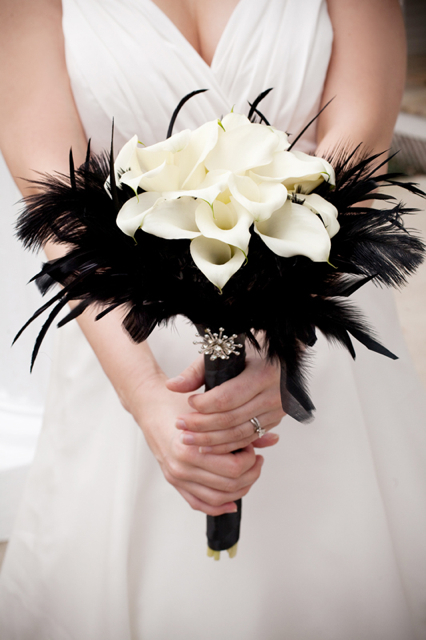 Black jeweled florets and black feathers were added to the bouquet. 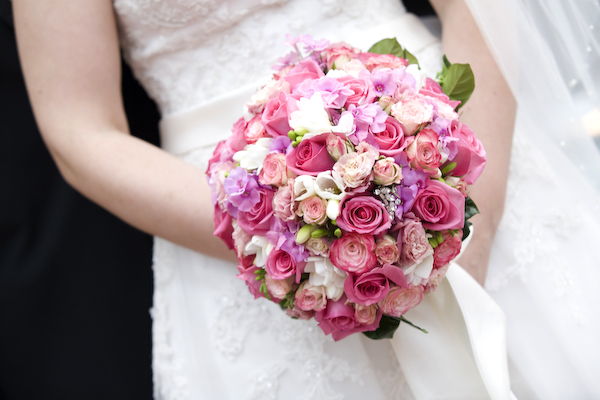 The bouquet can be created in the Spring into early Summer. Photography by Bob Uppdegrove. 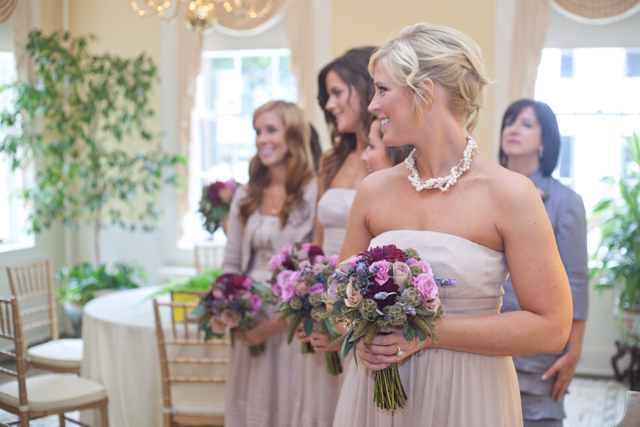 Antique green hydrangea, was used to offset the purple of the maids dresses. 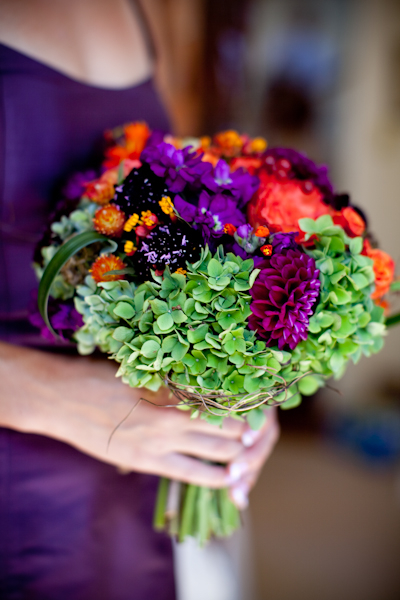 We used purple stock, purple scabiosa, purple dahlias, orange roses, orange globe amaranth, and orange asclepias in this bouquet. 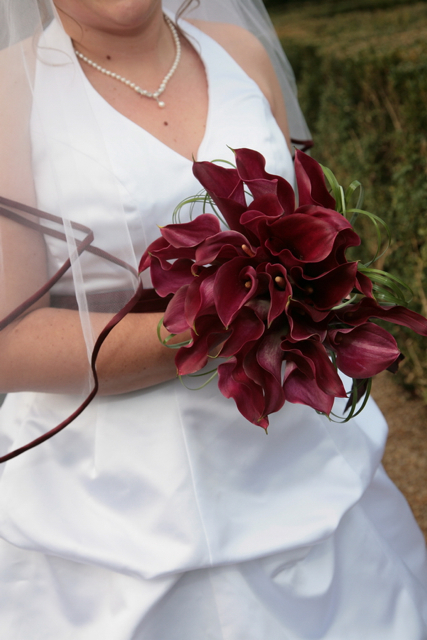 We also looped lily grass around the bouquet. Photography by Genevieve Leiper. 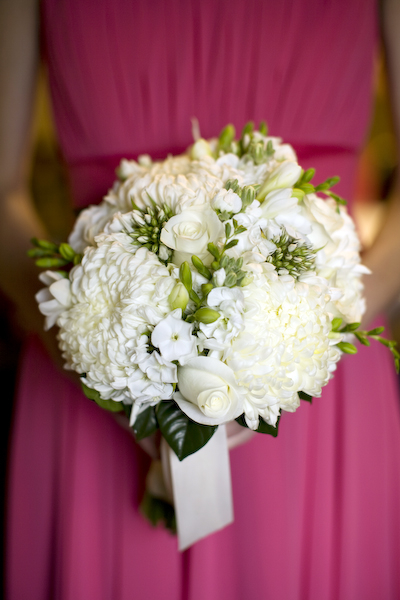 This bouquet began with at least 30 green carnations. I know carnations, you think you hate them right? Well this bouquet can turn anyone into a carnation lover. 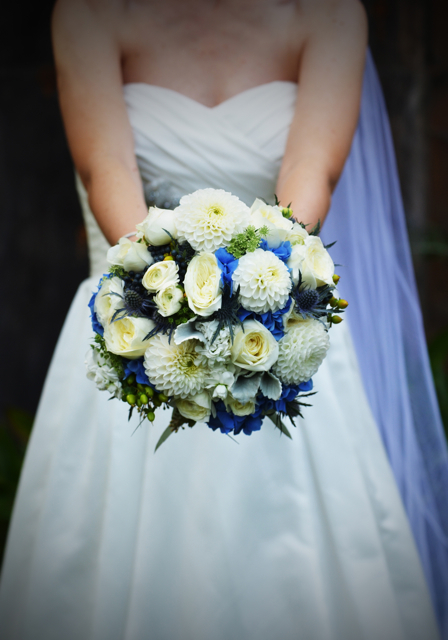 I added white freesia to the bouquet, queen annes lace, and blue lace cap hydrangea. This can be created in any season but you mostly likely will not find my lace cap hydrangea. Photography by Kate Headley. 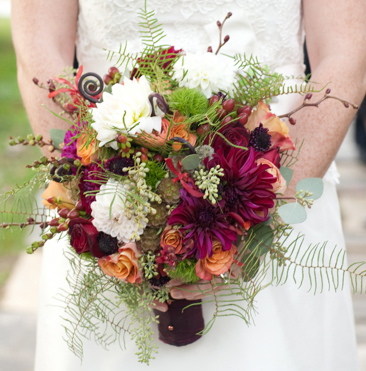 This bouquet was created of white and wine toned dahlias, sea star fern, fiddle head ferns, gypsy curiosa roses, seeded euc, crocosmia pods, red orchids, and green dianthus. This bouquet can be created in the Summer and the Fall. Photography by Mary Kate Mckenna. 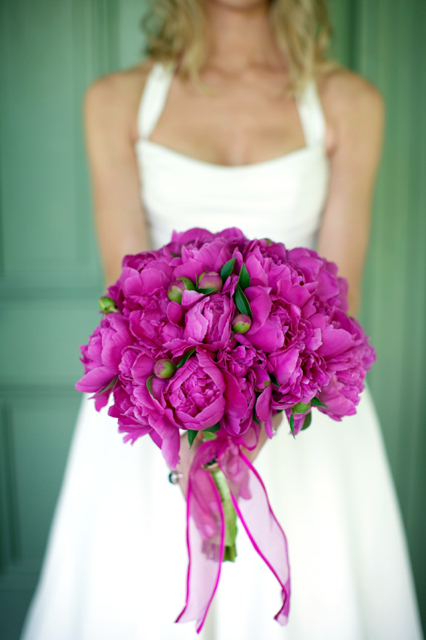 Maids carried bouquets of blue hydrangea, and the bridal was created of pink peony. The bouquets were created in the Spring. Photography by Sandi Foraci. 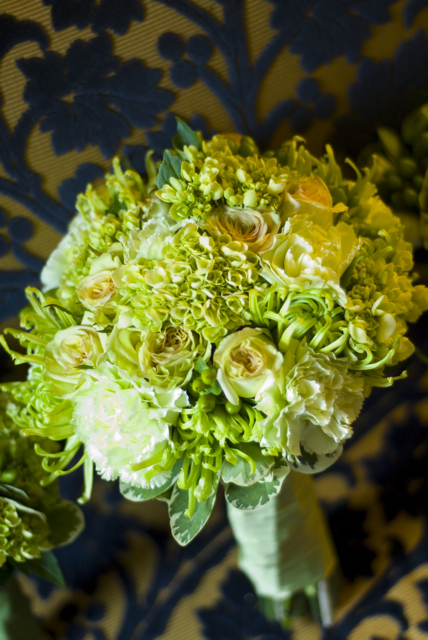 Green cymbidium orchids and green hydrangea were used to brighten up this fall toned bouquet. 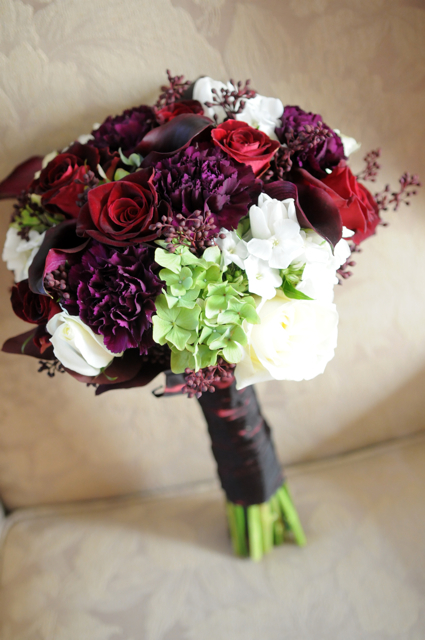 Dark purple callas, circus roses, red roses, and black baccara roses and green brazilia were the final ingredients. 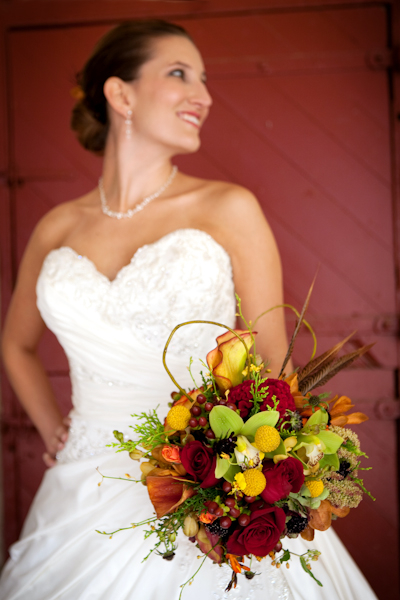 This was a Fall bouquet but can be created in all seasons. Photography by Genevieve Leiper. 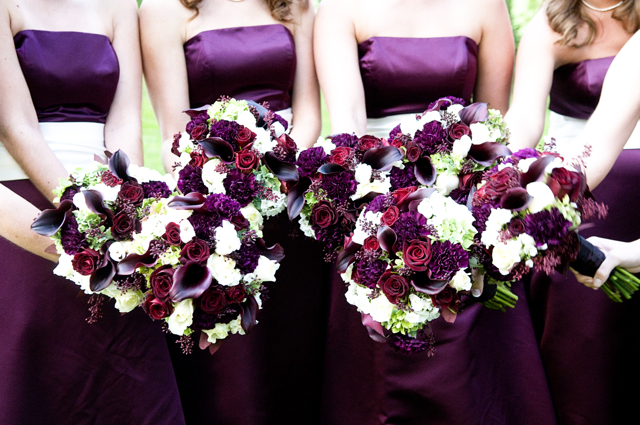 Dark purple black callas, black baccara roses, green hydrangea, red seeded euc, white stock, white phlox, and dark purple callas created these maids bouquets. 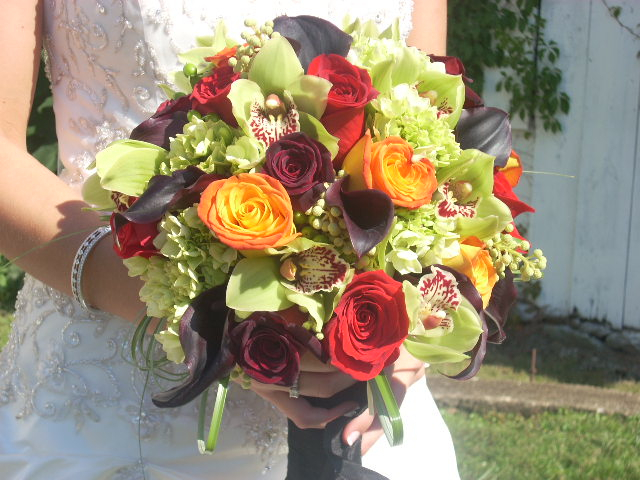 This was a Fall bouquet but can be created in most seasons. Red seeded euc is usually only available in the Fall. Photography by Julia MacInnis. 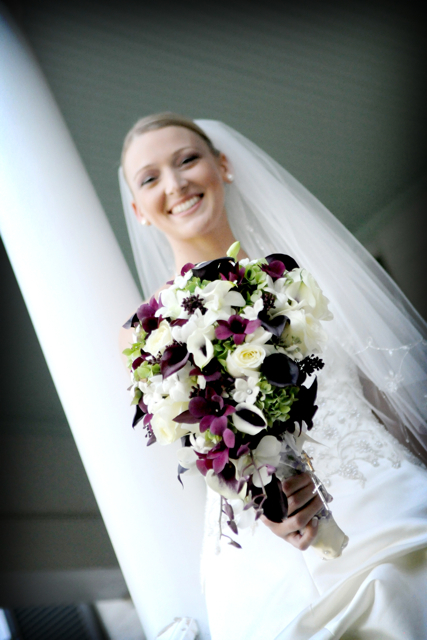 This cascading bouquet was created with dark purple dendrobium orchids, purple mini callas, white mini callas with the purple center, green hydrangea, white roses, white freesia and white stephanotis. Red seeded euc was also used to add berry to the bouquet. Photography by Julia MacInnis. 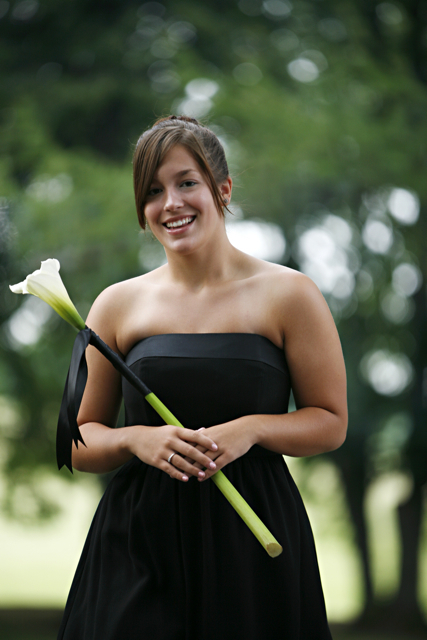 One large open cut calla lily was used to create this very simple bouquet. The calla was wrapped with black satin ribbon. This can be created in all seasons. Photography by Love Life Images. 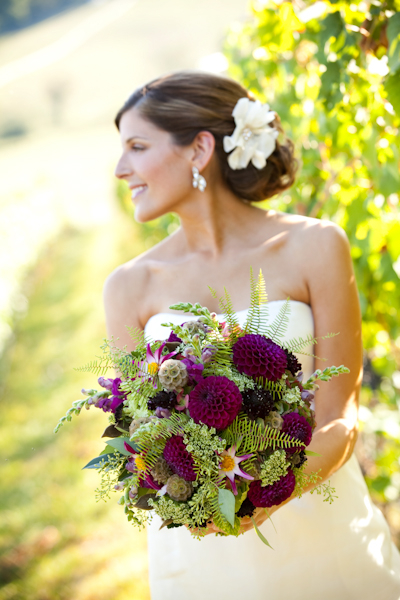 This bouquet was created in the Fall of dark milva roses, antique burgundy green hydrangea, burg dahlias, seeded euc, wine toned callas, scabiosa pods, fiddle head ferns and ornamental grasses. The bouquet was bound with bark wire and grandmothers brooches. Photography by Geneveive Leiper. 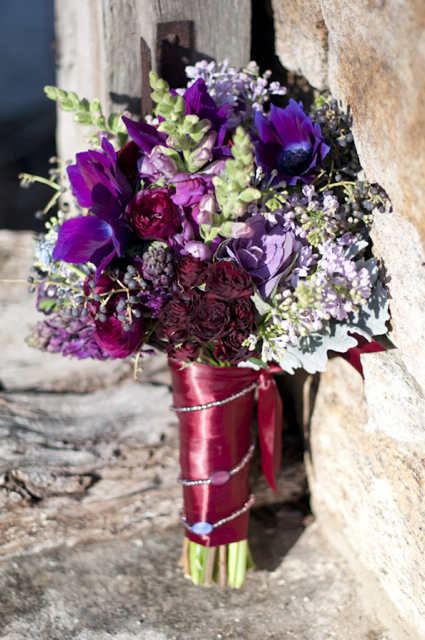 Purple anemone, purple lilac, wine colored snapdraagons, plum ranunculus, burgundy red spray roses, blue privet berry, and dusty miller were used to create this Spring bouquet. Photography by Julie Renee. 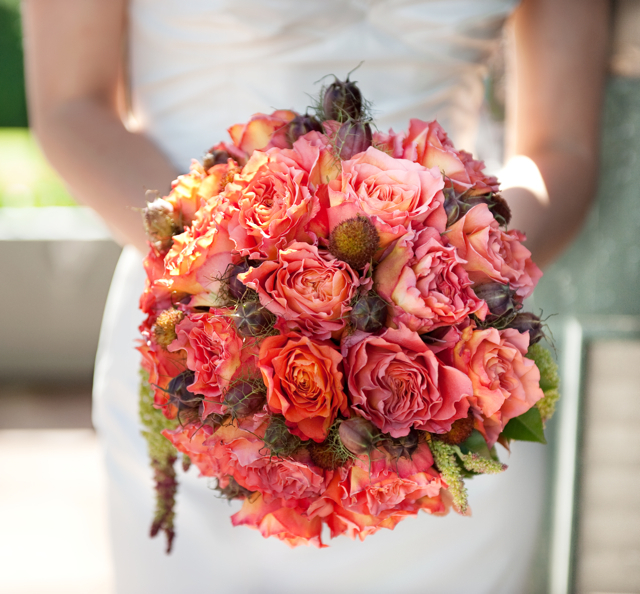 Orange gerbers and roses, mixed with hot pink roses and gerbers were used to create this bouquet. 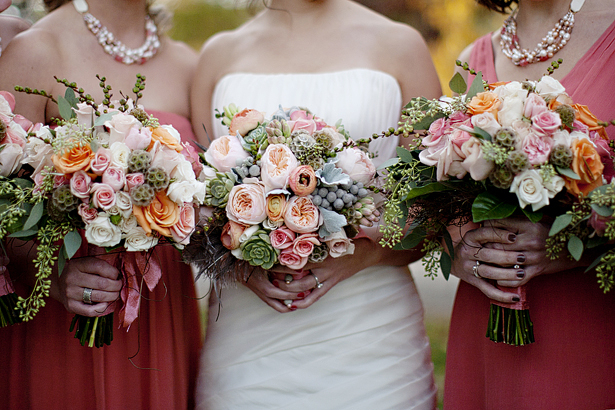 The bouquet can be created in all seasons. Photography by Michael Bonfigli. 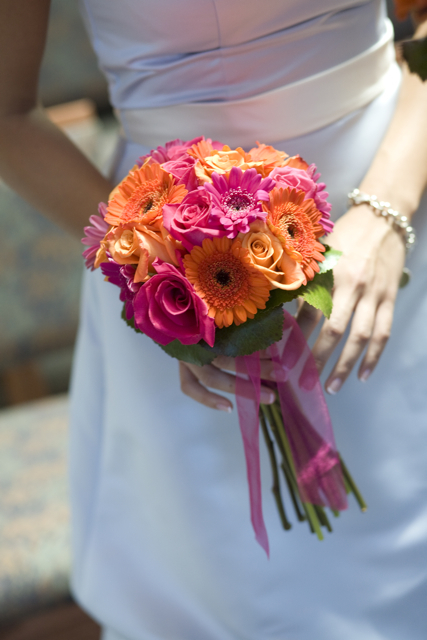 This bouquet was designed with pink callas, pink cymbidium orchids, pink and orange roses and pink gerber daisies. 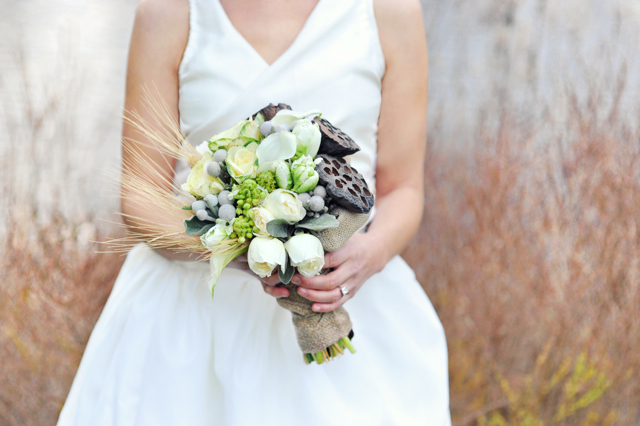 The bouquet can be created in all seasons. Photography by Michael Bonfigli. 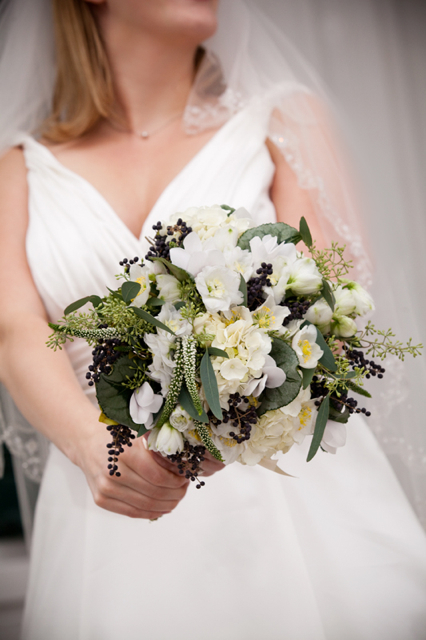 The stunning bridal bouquet was created with green cymbidium orchids, greeen hydrangea, white mini callas, white freesia, and green hypericum berry. 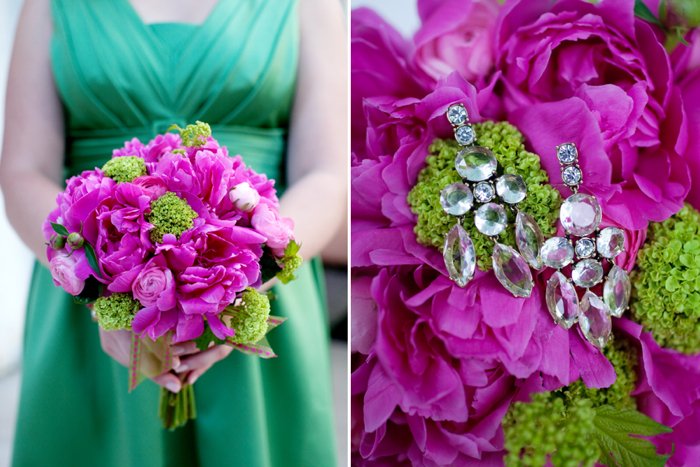 We used antique green hydrangea for the maids bouquets with green hypericum berry, wine toned dahlias and callas. Photography by Martha FitzSimon. 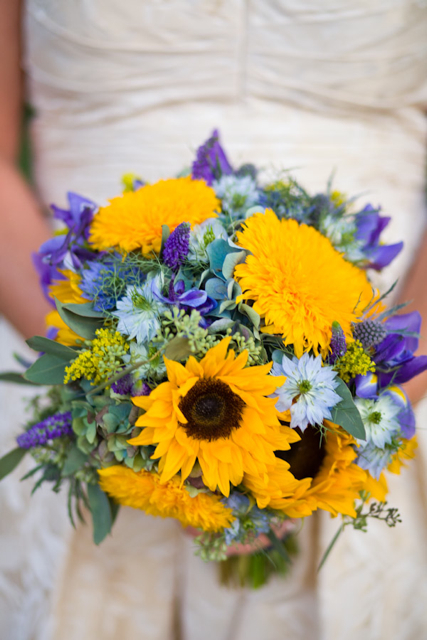 This lovely bouquet was created with pale yellow spray roses, golden dahlias, blue privet berry, green dianthus, brown hypericum berry, white gooseneck loosestrife, combo roes, maganolia leaves, green seeded euc, and brunia. This bouquet can be created in the Summer or the Fall. Photography by Kate Headley. 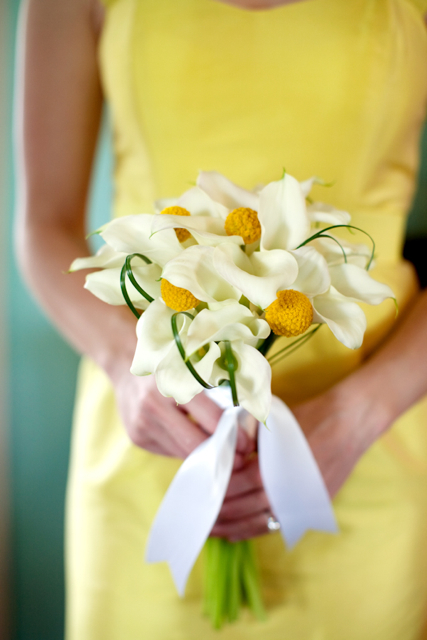 White mini callas were mixed with yellow billy balls to design this striking bouquet. This is a bouquet for all seasons. Photography by Genevieve Leiper. Red dahlias, blue privet berry, purple scabiosa flowers, white freesia, queen annes lace, fiddle head fern, scented geranium, and red hypericum make up this Fall bouquet. Photography by Kate Headley. 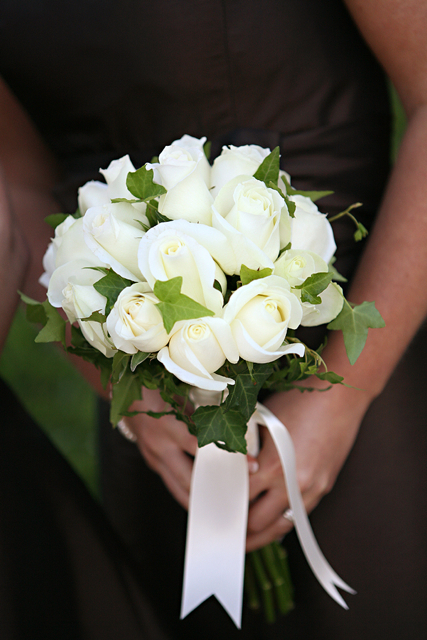 White roses mixed with green ivy were used to make this simple but lovely bouquet. This can be created in all seasons. Photography by Kristen Gardner. 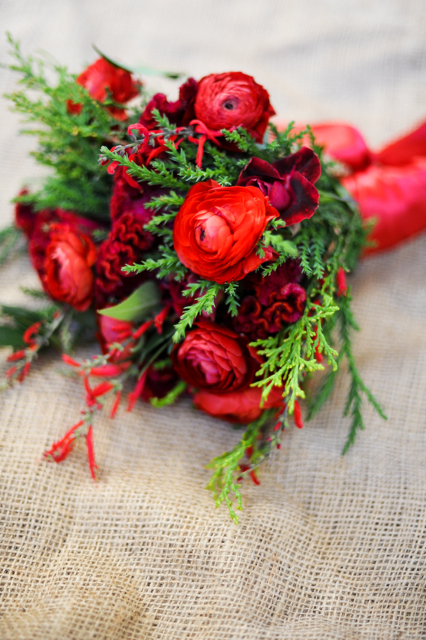 Red ranunculus, pineapple sage, black beauty roses, and red coxcomb, were mixed with evergreen. This is a Fall or Winter bouquet. Photography by Hannah Chapple. 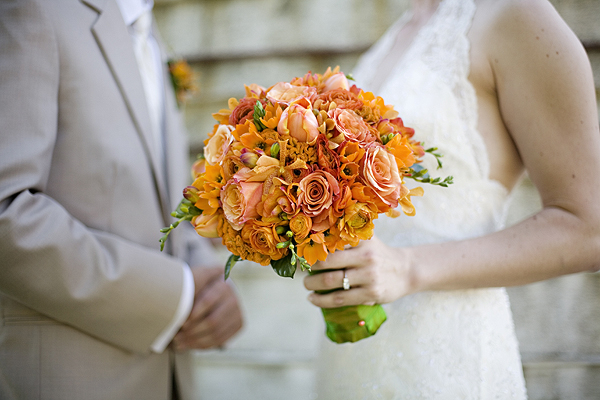 An all orange bouquet was created with roses, freesia, coxcomb, spray roses, orchids, and star of bethleham. 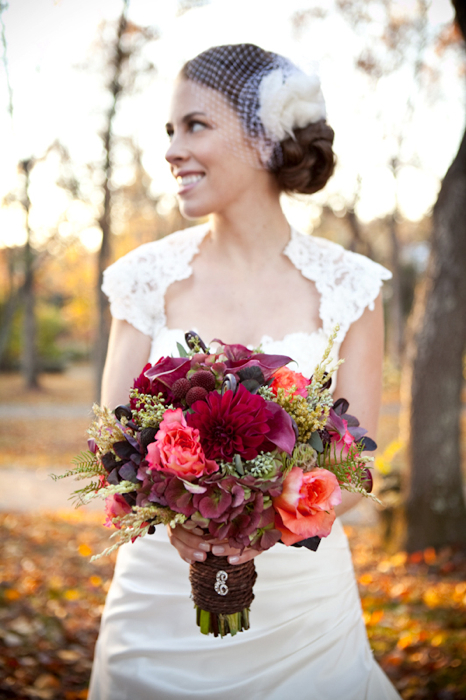 This bouquet can be made in all seasons but the Coxcomb is only available in the late Summer and Fall. The photograph was taken by Kristen Gardener. 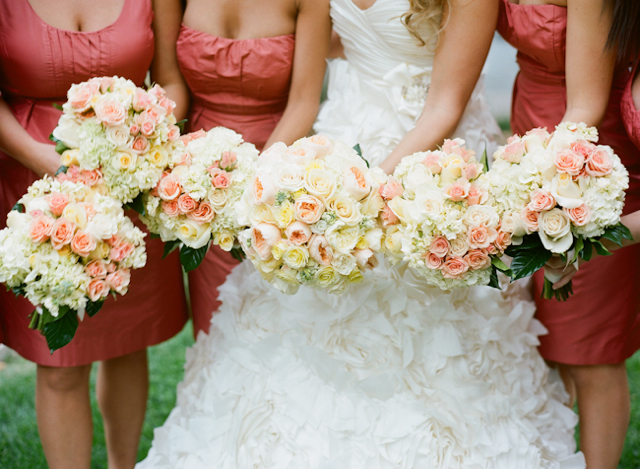 Light pink gerbers and white gerbers were pulled into a bed of cream and green hydrangea. 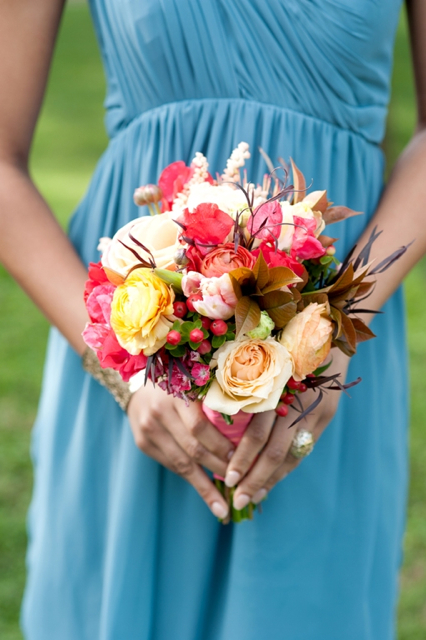 The bouquet can be created in all seasons. 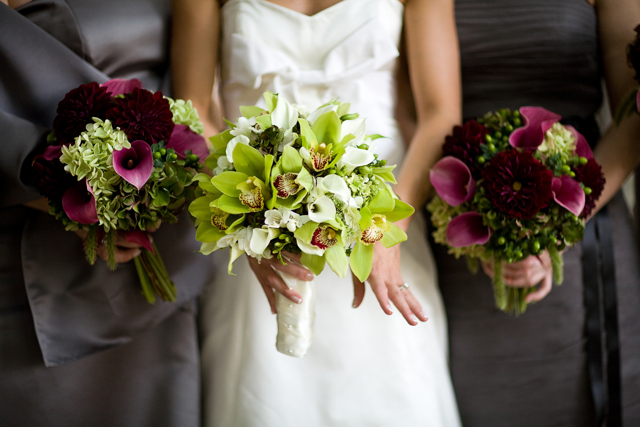 Brown cymbidium orchids, were mixed with seeded euc, and cream vendella roses. The bouquet was surrounded by copper wire. 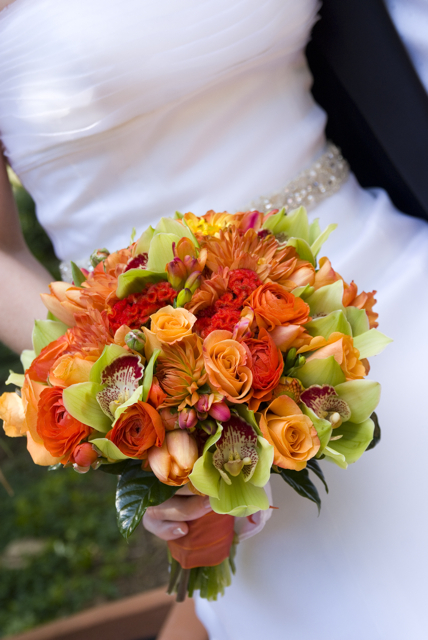 The bouquet can be made in all seasons. Photography by Joylyn Hannahs. 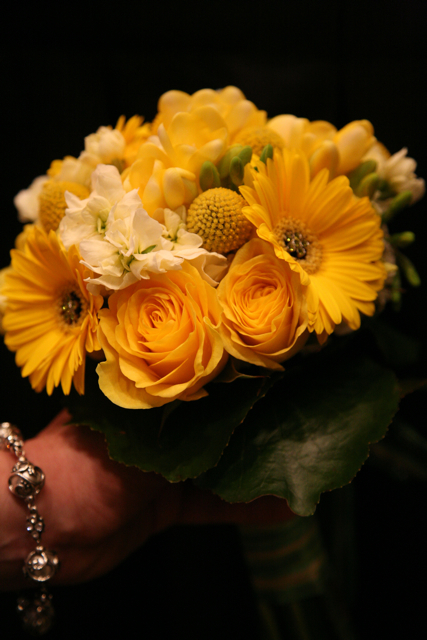 Yellow gerbers, yellow freesia, yellow billy balls, cream stock and yellow roses were used to create this bouquet. This can be created in all seasons. Photography by Joylynn Hannahs. Variegated red rose were gathered together and lily grass was woven through the design. 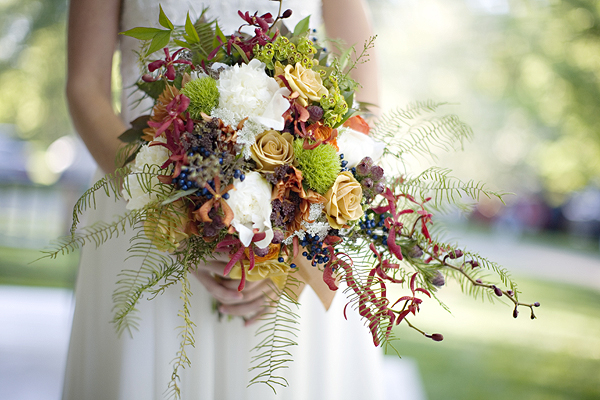 This bouquet can be created in all seasons. Photography by Joylyn Hannahs. 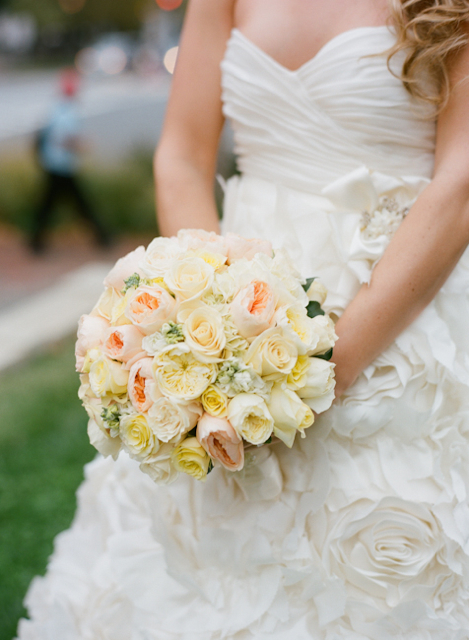 Peach apricot beauty tulips were used with cream vendella roses, peach roses, and ilsa spray roses. Variegated foliage’s were used to color the bouquet. The bouquet can be created in all seasons however you may only be able to have the tulips in the Spring. Photography by Joylynn Hannahs. White freesia, white lilac, white eucharist lily, white tulips, white hyacinthus, and blue privet berry were used to create this Winter bouquet but many of the blooms are available in the Spring. Photography by Genevieve Leiper. 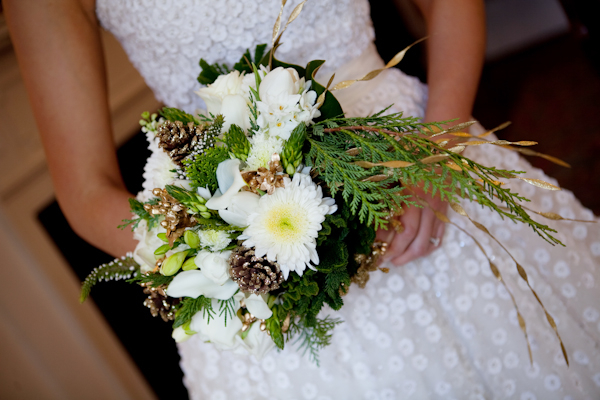 White mums, were mixed with gold pinecones, evergreens, star of bethlehem, white mini callas, tulips, and white freesia. This is a Winter bouquet. Photography by Genevieve Leiper. 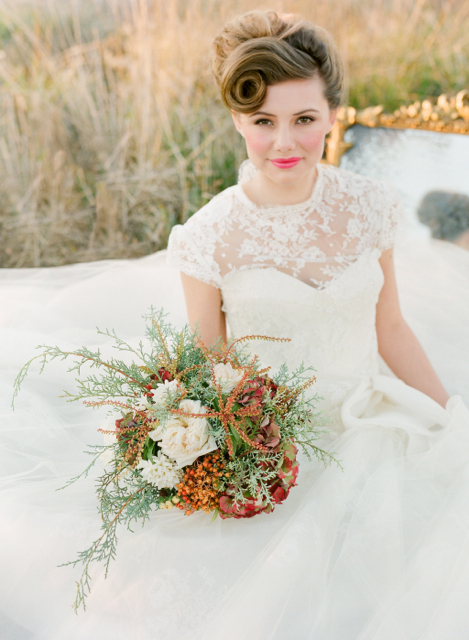 Evergreens and pheasant feathers were used to create this dramatic bouquet. Twigs and berry also gave the bouquet texture. This can be created in all seasons. Photography by Genevieve Leiper. Wine colored calla lily were surrounded by lily grass. Available in all seasons. Photography by Ron Jones. 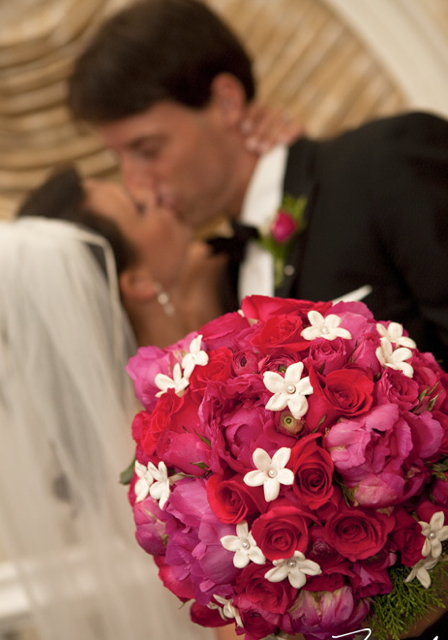 Hot pink roses and hot pink peony were gathered together and white stephanotis blooms were inserted into the bouquet. The bouquet was created in the Winter but it also could be made in the Spring. Purchasing peonies in the Winter is always costly. Photography by Freed.